When lace making is mentioned in England, many will first think of Nottingham where, for over a hundred years, vast quantities of the product were produced to trim the fashions of the age and to adorn windows the world over. While this is certainly a disservice to the hand-made origins of the craft practiced throughout the south midlands - particularly Buckinghamshire, Bedfordshire and Northamptonshire - and in Devonshire, it was the sheer scale of the Nottingham area industry that swamped and ultimately destroyed the hand-made and brought lace to a mass market on a world-wide scale. Early Innovations - There had been no hand-made lace tradition in the Nottingham area so there was no sentimental attachment which inhibited local attempts to develop machines to emulate the hand lace makers. There was, however, a ready-made basis for that development. Since the end of the 17th century, hosiery and related products had been knitted on frames, operated by hand (and feet) in a cottage-based industry, mainly within the Nottingham, Derby, Leicester area but, by the end of the 18th century that industry had faced the classic squeeze of over capacity facing declining demand - together with sometimes avaricious middle-men. And, there was another factor - knitting frames had traditionally used wool and had resisted the use of cotton which was imported, expensive and was seen as a difficult material to work with and which produced a less durable product. Richard Arkwright's cotton spinning machine of 1789, powered by water by 1775 and Samuel Crompton's 'Mule' of 1779, changed all these preconceptions and opened up new possibilities. It is not surprising, given these changing circumstances, that the more enterprising looked for alternatives and opportunities to exploit the newly available materials. Notable amongst these were the many attempts to adapt the knitting frame to make lace, a product which was much more fashionable and profitable - and, of course, used cotton, or sometimes silk, thread. These early, often ingenious, sometimes impressive but largely short-lived innovations - most of which appeared in Nottingham and the surrounding area - in which the stocking frame was adapted to produce 'lacey knits', known as Point Frames - began to appear around 1760. Essentially, they involved attempts to introduce a pattern to the simple net - where all the identical loops in a row were made at the same time - by manual, or eventually mechanised, methods of modifying the individual loops. This progressive innovation meant that nets, rather than specific items (notably stockings), began to be produced on the frame, using increasingly complex modifications - notably the 'tickler bar'. Something approaching lace nets was now possible on the frame but it was not, in the longer term, to save the framework knitter. In particular, the development of the warp frame, an important development in the changes in this era, far from giving them hope resulted in despair and rioting - notably the Luddite frame breaking disturbance between 1811 and 1817 - when the fabric it produced could be 'cut-up' to produce items - such as stockings - previously shaped by the knitter. These changes and the mechanisation that was to follow, completely overwhelmed the frame knitters such that by the early years of the 19th century, as a group, they were in extreme poverty. Conversely, as we will see, those who were to work the emerging lace machines - the 'twist hands' - were to prosper for the best part of the next 100 years - although it was to have its periods of decline over the decades. The Development of Lace Making Machines - But, so far, the modified frames - ingenious as they were - had not been able to reproduce bobbin lace, with both net and pattern as a continuous whole, with characteristic twisted threads. The first practical machine which would imitate the bobbins used to produce the hand-made lace, producing a tulle netting which was called 'bobbinet', was invented in 1808 by John Heathcoat and improved by his first commercially viable machine - known as the 'Old Loughborough' - in the following year. Heathcoat moved from Hathern, Leicestershire to Tiverton, Devon in 1816 after his factory was attacked by former Luddites who were widely believed to be in the pay of Nottingham lace makers. In Tiverton, he had built a new factory, where he continued to innovate, prospered and rigorously enforced his patent rights, eventually using a system of licencing. His location in Tiverton was, however, the exception as the trade continued to be centred mainly in the East Midlands, notably in Nottingham and its surrounding area. In 1813, John Levers (or 'Leavers' - there is much uncertainty with the spelling), working in Nottingham, invented the Leavers (or 'Levers') machine which was modified and developed greatly over the years - notably improvements in it's patterning capability, mechanisation (both Heathcoat's and Leavers' machines were originally hand-driven and steam-power was not widely adopted until the 1850s) and, particularly significantly, by the addition of a Jacquard device to control the patterning (with the Leavers machine from about 1841 but not used generally until the 1870s), Jacquard devices, invented in France in about 1816, used a continuous roll of punched cards to control the thread movements and thus the pattern of the lace. The Leavers machine was to dominate the making of lace, particularly in the Nottingham area, even in what remains of the industry today. 'Twist Net Fever' - These developments - both in the machines themselves and their product - brought about a frenzy of activity, particularly in and around Nottingham in which enterprising knitters - and, indeed, anyone else who had the iniatitive and those with some precision engineering skills - such as watchmakers - joined in the rush to profit from the making of both lace and the machines that could make it - accompanied by widespread copying of innovations by others. This boom was particularly at its peak after Heathcoat's patent expired in 1823 when a free-for-all developed - known as 'twist net fever'. Frames - invariably hand driven at this stage - were being worked in every spare space. Enterprise of this kind required capital which was often provided by others - bankers, farmers and professional men, keen to join in for a good return on their money - who rented frames in much the same manner that had been traditional for knitting frames. This frantic period lasted only a few years until the inevitable slump, caused by over-production, had ruined many speculators as early as 1825 and many more in the years that followed. It was a tragic time for many, but the more resilient lace makers - several of whom went on to be leading figures in the industry - were able to benefit in the long-run by acquiring machines from discouraged investors at depressed prices. In 1828, those machine owners who had survived attempted to hold things together by a collective agreement to restrict the working day to 12 hours - rather than the 18-20 hours that had previously been widespread. Although the resulting Restriction of Hours Deed of 1829, vigorously promoted by William Felkin, was signed by the majority of smaller machine owners. it ultimately failed from lack of support from the larger owners. A public meeting in March 1829 had stipulated that it required the support of the owners of 87.5% of the 4,000 or so machines to become effective. With almost 30% of the machines held by the relatively few owners with 20 or more machines this was an impossible threshold to meet without their support. The surviving deed, though admittedly incomplete, was signed by only two owners with more than 20 machines - none more than 24. The most resilient of these owners were eventually to emerge, with many going on to become the big names in the industry as it matured and went on to its height later in the century. Another important characteristic of the industry in this period, evolving as it did from the cottage-based frame knitting industry, was the small scale of the premises in which it operated in the early days. As the number of machines increased in number, while still in the hands of many small owners (half the machines were owned by those with less than five in around 1830), they used every available stable, garret, outbuilding and kitchen to work the machines. In Nottingham, as space in available areas and buildings came under pressure they began to move out of the overcrowded city, restricted by a very late enclosure, to the suburbs of Radford, Sneinton, Lenton - and Beeston - where they began to evolve the purpose-built factory. This move to larger premises took place relatively late in Nottingham - compared with, say, the West Country where Heathcoat and his followers had built 10 purpose-built factories by 1829. In the Nottingham area the change came later and became more pronounced as machines increased in size. Then, the space to operate a machine became difficult for the smaller operative to own in his own right and the practice of factory owners renting the necessary machine space - known as a 'standing' - became widespread. It was a practice that had early origins but became commonplace in the trade when larger machine-driven machines became the norm. Henry Kirkland - was born in Wollaton in 1782 2, the son of Henry Kirkland (c1742-1827), a farmer, and his wife Elizabeth (née Shaw). After first making lace in Radford, he moved, with his wife Ann (née Slack) 3 and their family, to Beeston in 1819 and set up a lace workshop on Moorgate, near its corner with Market Street (now Middle Street) - a building which survived until relatively recently but has since been redeveloped. By 1825, he was employing over 100 hands 4. By 1841 he and his family were living in the Manor House, adjacent to his workshop on Market Street 5. It is possible that he also had workshops on nearby Chapel Street, The couple had at least eight children; this included four daughters, none of whom appear to have survived infancy. Kirkland was also a Wesleyan Methodist local preacher who opened a room on his premises - probably on Chapel Street - where services could be held. A society was formed, and in 1821 a chapel on Chapel Street was acquired from the New Connexion Methodists. With his guidance and support, a larger chapel was built in 1825 and was further enlarged in 1839, when a day school room was added 6 (See more). Henry and Elizabeth's two older sons continued Henry's commitment to Wesleyan Methodism. Their eldest son. John (1804-1857) 7, left in 1834 to settle with his wife Sarah (née Attenborough, 1802-1858) 8 and their family in Puslinch Township, Wellington County, Upper Canada (later Ontario). Here, he became a superintendant of schools and a prominent member of the local Wesleyan community 9. 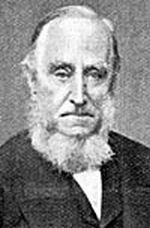 The next son, Henry (c1814-1877), also became a Wesleyan Minister 10. Henry Kirkland died in November 1853 and was buried in Beeston Churchyard with his wife, who had died in 1851 11. With his two oldest sons having decided on following other callings, it was left to his third son, William (1823-1894) 12 to continue the family lace business. Under William's control, the business continued until some time in the 1880s, although, it seems, on a generally diminishing scale. For that, we have the evidence of two census returns which recorded the numbers he employed - in 1861 he employed a total of about 70 13, a figure that dropped to 40 by 1881 14 - a decline of 43% from the 1861 level. Overall figures, however, give a somewhat misleading picture but we can use the detail of this example to illustrate the make-up of the workforce in a typical smaller workshop. Although, of course, all employees contributed, in the lace industry it was the adult male employees who held the key jobs as 'twist hands' - those who worked the machines to actually make the lace. Women were, essentially without exception, involved exclusively in ancillary tasks - such as bobbin winding, threading and mending. Children, boys and girls alike, were employed - often as young as nine - as threaders and winders and as 'jackers-off' - those who removed unused thread from the bobbins. Using these criteria, a more true measure of a lace company's growth or (as in this case) decline, is to measure changes in the number of male employees. In this case, 35 men were employed in 1861, falling to 27 in 1881 - a fall of only 23%, perhaps a much better measure of the fall over the 20 year period. William always called himself a 'Lace Manufacturer', a title which is consistent with the widely accepted (if strictly inaccurate) use of the term - a self-employed, employer of lace makers 15. Most firms of this size in the Nottingham area - and is unlikely that Kirkland's was an exception - sent their 'unfinished' lace to warehouses - mainly in and around Nottingham's Lace Market - to be 'finished', including washing, bleaching, clipping, scalloping and embroidering ('running'). These parts of the industry were carried out overwhelming by female labour and, to a significant extent, by outworkers. While the factory was operating, it seems William prospered along with it - until 1872, he continued to live in the Manor House, with his wife Eliza and their two children 16. In 1872, they were able to purchase The Grange in Beeston 17, where they were able to enjoy a genteel life with 'pleasure gardens .. coachhouses, groom's cottage .. hothouses, conservatories' amongst other delights (See more). In 1885 however, Kirkland sold The Grange to Edward Smith 18 and moved to 3 Humber Road, Beeston 19 - perhaps a more suitable property for his retirement or perhaps there had been a need to raise funds. He died in 1894 leaving only £144, a remarkably small amount when compared with the £3,500 he received for The Grange 20. William Vickers - as we have seen, the early lace makers tended to set up their machines in any space that was available to them. These early machines, often built of wood, were of a scale that was similar to the knitting frames and the use of available space, often not much more than the domestic environment and often where the knitting frame had been worked previously, was a natural first step. Although true factories had been pioneered in the area by John Lombe with his silk mill, built in Derby in 1704, and by Richard Arkwright with his water-powered cotton spinning mill, dated 1771, at Cromford, Derbyshire, the adoption by the knitting industry had to await mechanisation, later in the 19th century, before there was a move towards true factory production - although purpose-built workshops adjacent to homes for use by the occupants, in which hosiery could be made more conveniently, was a tentative first step. And so it was with the lace trade, where the move towards factories really did not happen until machines became larger and, as well, it became advantageous to work groups of machines, increasingly with the use of a common power source, and with a labour force larger and more structured than the traditional domestic group. The first building in Beeston that could be described as a 'factory' was the silk mill (See more), built in 1826 by the Nottingham hosier, William Lowe, but it was sometime in the next decade before a purpose-built lace factory was erected in Beeston. As was more typically the case with factory buildings, it was built outside the village core where land was more readily available. This initiative was by the Nottingham lace manufacturer, William Vickers who built a relatively small factory for lace production on the north side of what is now Albion Street, to the north of the village core. Vickers was born in Mansfield in 1797 21 and, despite little early formal education and being put to work at the age of seven, by the age of 21 he had gained an education through his own efforts, alongside serving a 7-year apprenticeship as a lace maker and had started as a lace manufacturer in partnership with Henry Frearson. Little is known about the details of the Beeston factory other than it was relatively small - about 475 square yards. By 1845, Vickers had ceased manufacturing on this site and was offering it for sale. 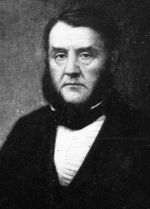 It was about this time that Henry Frearson retired and it is likely that Vickers had decided to concentrate his time and efforts within Nottingham itself, where he lived and had his main business interests and where he had become very active on the Town Council and, in fact, served as Mayor in 1843/44 22. He retired from business in 1863 after which the firm came under the control of his son, William Vickers, and subsequently, his son Charles H Vickers who formed a partnership, in 1898, with Groves C Hine to become the well known, Nottingham-based firm of Vickers & Hine 23. William Felkin - had been in partnership with William Vickers since 1832, at first as commission agents, selling lace for smaller lace makers and later, beginning to manufacture lace themselves - probably at the small Beeston factory described above. The two men had much in common having each grown up in relatively poor families where what education they did receive was little more than the basics and both had to fall back on their own efforts and determination to improve and to progress in life. Both recognised the need to work to improve conditions in Nottingham, where overcrowding was then causing major health problems and both worked to bring about overdue changes, as members of the Council and, in due course, as Aldermen. Both served as Mayor and both were active Baptists. This religious dimension was often found amongst knitters and the early lace makers, providing a framework, meaning and purpose for their lives which appears to have helped them when facing the often inevitable difficulties. Felkin was born in Ilkeston, Derbyshire in 1795 24 into a family of framework knitters, which was then experiencing great hardship in a time of great difficulty within that industry. Seeing his parents living with extreme poverty during his childhood years was a memory that stayed with him throughout his life. Nevertheless, William was fortunate enough to receive a basic education in a local school. In 1803, his father - also William 25 - had become a Baptist minister and had moved his family to Kegworth, Leicestershire where his ministry had taken him and where he also set up a school. As was certainly not unusual for boys in that era, William started as an apprentice at the age of only twelve - many were put to work much earlier - with a baker in Castle Donington, Leicestershire. Perhaps this was an attempt at a move away from the knitting frame and an industry in crisis - but this came to an abrupt end after about a year when disagreements arose. Then, in a move that was to be very significant to the development of his subsequent career, he was placed with his grandfather, also William Felkin, a framework knitter in Bramcote, Nottinghamshire who, in turn was able to use a business connection with the Leicester and Nottingham firm of Heard & Hurst to secure an apprenticeship for the young William there 26. The senior William was typical of the hard-working, straight-dealing and highly moral working men who, despite a difficult lives, had found fulfillment and purpose in the Non-Conformist chapels - in the case of the Felkins, in the Baptist Church. In the main, they adopted the principal of 'self-help', avoided involvement with collective rebellion and judging themselves, personally and as a community, against the highest standards of probity. William, his grandson, apparently describing him in old age, wrote, '... (he) had only once joined in a combination, and was of the opinion that they never had a beneficial result. He would never go further than general representations to the master on the part of the workpeople, and that only with a view to an amicable adjustment of the points at issue. He urged the maxim, upon which he had acted himself, of every man so providing, by economy, sobriety, and industry, as that it should never be worth his while to accept of unreasonably reduced wages.' 27 These were principles that were to guide his grandson throughout his working life and he was to apply similar ideals in his public life. William's abilities and energy - which included as much self-education that he could fit into any spare time he had - soon caught the eye of his employers at Heard & Hurst, such that he began to be given more and more responsibility. When the firm's frames were under threat from the Luddites, the young Felkin - who had sympathy with the plight of the knitters but did not support the violence - was sent on horseback, over a wide area, to let the knitters know that wages had been raised and, as a result, the frames were not destroyed. In 1809, only three years into his seven year apprenticeship, he was sent to work at the firm's warehouse in London. These were valuable insights into an industry in transition and would prove to be valuable experience for this able young man who clearly had already made his mark 28. By 1820, he had begun to work in the lace trade on behalf of John Heathcoat and traveled in France and Italy seeking information on methods used there for processing silk. On his return, he was able to set up processes for reeling silk thread in quantity in Heathcoat's Tiverton factory. In 1826, he returned to Nottingham as Heathcoat's agent 29. It was also at this time that he began to study the knitting and lace making industries in detail, producing statistical analyses and reports for learned societies and government, which were to help understand and improve those industries for employees and employers alike. It is clear that he saw improvement of the lot of the working classes as mutually beneficial to both sides of industry when, in some years later, in 1837, he wrote - 'I have sprung from that class and I am mainly dependant upon it and have devoted that portion of time and talent I could command beyond the requisite attention to my private business, to the improvement of their physical and moral condition and the promotion of their real happiness' 30. There had been a particular example of his determination to help all sides of the industry in 1829 when, as we have already described, Felkin worked assiduously to try to get sufficient signatures to the Restriction of Hours Deed which would, he believe, assist the small machine holders and workers in particular, through the very difficult time that the industry had encountered. In the event, despite all his efforts, it was not possible to obtain sufficient signatures and, as a result, the larger manufacturers prevailed and many small enterprises were to fail. The Deed, however, survived and continues to provide a snapshot of the industry at that time 31. Those machine holders from Beeston who signed the Deed, representing about 75 machines, are detailed here. In Beeston, as we have seen, Felkin had been involved with William Vickers' lace factory for a short time prior to 1845 32 and, some time after that, this factory was acquired and, it seems likely, enlarged by Felkin. He himself continued to live in The Park, Nottingham 33 from where he was heavily involved in his other business interests and as a very active Alderman. The day to day operation of the Beeston factory was delegated to his two oldest sons, William (b. 1824) and Robert (b. 1828). By 1851, William junior was recorded as a lace manufacturer and employing 120 hands 34. These employees were probably at the Beeston factory although, at that time, he himself continued to live in Nottingham, apparently leaving day to day management to his brother Robert who was then lodging on Union Street, Beeston 35. Over the next ten years, the business continued to grow and by 1861, William had 53 lace machines, employing 107, and Robert had 39 machine on the site and steam had been introduced to run them 36. By now William had moved to Beeston and was living on Broadgate in 1861 37 and Robert, who had married in 1852, had set up home on Villa Street, close to the factory 38. By that time too, the Felkins, particularly Robert, had introduced rotary hosiery knitting machines - then a concept that was new to the industry. The business, however, had been heavily financed by Nottingham-based Wrights Bank and, by this time, it had begun to face financial difficulties. In 1864, the loan was called and the company closed owing £42,000 to its creditors. William senior, who had backed the venture, faced financial ruin but, in a move that demonstrated his standing in the community, he was saved from bankruptcy by a group of his friends who also funded an annuity which enabled him to continue his writing as an authority on the industry and on his work for the community in Nottingham. In 1867, he published 'History of the Machine-Wrought Hosiery and Lace Manufactures' which continues to be recognised as a leading account of the development of these key local industries. He died at his home the The Park, Nottingham on 26 September 1875 39. Felkin and his wife Susanna had seven children who, in the main, managed to survive the financial set-back, despite the direct involvement of two of the sons. Mary Anne (1823-1867), married John Payerson Gardner, a banker's clerk and moved to Cambridge 40. William (1824-1885), found work as a yarn agent for a while, before moving to New Zealand where he died 41. Robert (1828-1899), moved with his wife and four children - each of whom had been born in Beeston - to Wolverhampton, where he had a successful career as the Commercial Manager of Mander Brothers, the major firm of varnish manufacturers 42. 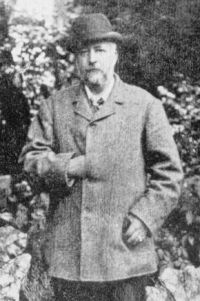 His eldest son, Robert William Felkin (1853-1926) married Mary Jane Mander, the eldest daughter of Samuel Small Mander, one of the firm's partners. He qualified as a doctor and became a medical missionary and anthropologist and African explorer. His interest in theosophy and occultism became focused on the Hermetic Order of the Golden Dawn. After the death of his first wife, he married Harriet Miller Davidson and they and his daughter Ethlewyn settled in New Zealand where he died in 1926 43. 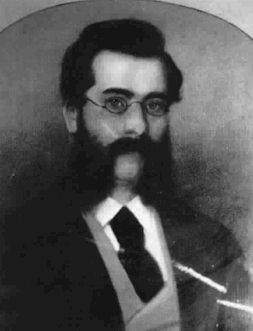 Robert's youngest son, Alfred Laurence Felkin (1857-1942), was a school teacher who married the Honorable Ellen Thorneycroft Fowler, a successful author, the eldest daughter of the Rt Hon. HenryHartley Fowler, the 1st Viscount Wolverhampton, a solicitor and Liberal politician who served as a Minister, first in Gladstone's Government and then those of Rosebery, Campbell-Bannerman and Asquith. Alfred Felkin was appointed HM Inspector of Schools 44. Charles (1830-1871), became a coal merchant in Nottingham 45. Elizabeth (1831-1863), left for Australia, where she married Thomas James Harrison, also from Nottingham, in 1862. She died in childbirth in the following year 46. In Beeston, the factory that had been busy and had provided jobs for at least 120 local people - probably more - was now empty and fell into disrepair. It would be another ten years before it became active again and, as we shall see, it would become part of the biggest lace factory Beeston was to ever see. That will be discussed later but, in the meantime, we must catch up with others who were known to be making lace in Beeston in the early years. Individual Enterprise - 1830-1850 - The years that followed the boom and bust years of the 1820s were marked by more measured progress. At the beginning of this twenty-year period, Kirkland's factory type operation was the only local employer of any size in the lace trade. Although, as we have seen, the Vickers factory also began to offer employment in the 1830s, much lace making activity continued to be carried out in Beeston by small-scale, self-employed workers who were able to combine the necessary manual ability with a degree of entrepreneurial spirit. These, as in the earlier days, worked in small units, perhaps with some family or outside assistance - though some would begin to make moves to consolidate into larger units and purpose-build workshops during this era. Many would have been able to acquire one or perhaps two machines - rarely was it more in this scale of operation - bought cheaply from speculators who had been discouraged by the downturn than had followed the period of frenzy and over-production that had come to a head at the end of the previous decade. These machines would have been almost all hand-powered, mainly of the Leavers type and increasingly being converted to produce patterned lace ('fancies') as, increasingly, automation took over the plain net trade. Eventually, the advent of steam, from about 1850, was to mark the end of manual working generally and of this phase of the industry. Meanwhile, it was this type of small-scale enterprise that affected the way the industry was organised overall. Few if any of these small operators did more than simply make the lace which was sold 'in the brown' to lace manufacturers - almost invariably in Nottingham itself - who would organise, usually with specialist firms, the appropriate and necessary additional processes - mending, dying, bleaching and finishing the lace - and would market it worldwide. It was in this period that Nottingham's Lace Market began to develop as the focal point of the lace trade where most of the major lace manufacturers were to be sited. The opening of the railway in 1839, connecting Beeston from and to Nottingham, thereby improving the connection with the Lace Market, added impetus the development of Beeston as a centre of lace making. Robert Thornhill - is known to have been operating three machines by 1829 48 and was one of several small and medium sized lace makers known to have been operating on Villa Street about this time. Born in Beeston in 1786 49, he was active within the local Baptist chapel - as, it seems, were other lace makers in the Villa Street area. His workshops appear to have been at the lower end and east side of Villa Street, near to the Turnpike (High Road), It is this site, fronting also on the High Road, that was later acquired by William Thornhill 50, his only son by his first marriage to Ann Cox in 1806. Later, this was to become the site where William and two later generations of the Thornhill family traded as tailors (see more) for many years. Robert married twice more and had at least ten children with his third wife, Elizabeth Cockayne (previously Kerry), including four sons, each of whom worked as a lace maker at some time in their lives. By 1851, it seems that the business had been taken over by his son Richard who is then recorded as operating four machines, although his father is living in an adjacent property and was still described as a lace manufacturer 51. By 1861, Richard had begun to diversify away from lace making by taking the position of Assistant Overseer and Collector of the Poor Rate - although he is still recorded as a machine holder and employing one man and 2 boys 52. Robert died in 1863 53, by which time, it seems, lace making had ceased at this location. Thomas Elliott - was one of several lace makers who were working in the Cross Street/Villa Street area by the 1830s. In 1829, William Booth had operated 10 machines there 54, and it appears to be his premises that were leased, in 1834 55, to Thomas Elliott who had recently moved, with his family, from Nottingham 56. Apparently built as a factory, this four storey building was known as Dobson's Mill or Bank Factory and was eventually to become part of the Pollard family's Swiss Mill (of which, more will follow). Elliott started at this site with just eight hand-operated machines but, in 1846, he introduced the 'Manchester' Jacquard to his Leavers lace machines 57. By 1851 he had expanded considerably, with 60 employees, and was also a small-scale farmer, then grazing 58 acres with the help of three labourers 58. Thomas had become a Wesleyan Methodist after his arrival in Beeston and was part of the group that broke away in 1849 to form a Wesleyan Reform Chapel which met, in its early days in a room at the nearby Commercial Inn but later built a chapel on Willoughby Street 59, probably with help from Thomas Elliott. By 1851, Elliott was the manager of the chapel farm which was then in the Cross Street area. After the death of his wife Mary in 1852, Thomas married again 60 and, it seems, left the area. John Horsley - John and his brothers Samuel and James were perhaps more typical of the early small-scale lace making entrepreneurs as they appear to have appear to have survived adequately rather than prospered greatly in their business. They were apparently the sons of Samuel & Mary (née Young) Horsley and came to Beeston from Nottingham in the 1820s 61. It seems, however, that they avoided the severe difficulties that followed the period of 'twist net fever' that was then developing, as the first record we have appear in a 1832 directory which lists the firm of 'Horsley & Fawkes'. This is repeated in 1835 but, in 1840, John is listed trading alone as a lace maker in Beeston 62. In the census of the following year, each of the brothers is recorded as a Beeston lace maker 63 - as they still are in 1851, then all living very close together on Brown Lane, Beeston (now the upper part of Station Road), surrounded by a cluster of lace trade workers 64 and John had listed his business address in 1849 as Brown Lane 65. John died in 1852, followed by Samuel in the years before 1861 and James in 1862, after first moving to Chilwell 66. Henry Cross - was part of a large, complex and long standing local family. Two men of that name, father (1782-1842 67) and son (1801-1873 68), were making lace at various times during this early period and it is sometimes unclear which is referred to in the available records. Henry senior is particularly interesting because it appears to be he who is recorded as a signatory of the Restriction of Hours Deed in 1829 as the owner of six lace machines - the fourth largest of the Beeston owners who signed. It appears that he and his son were working these machines in the Villa Street area, probably adjacent to where William Booth was operating ten machines. As we have seen, a new street was opened up at that time, joining Butchers Lane (now Wollaton Road) and Villa Street in the area where Booth and Cross were operating. This is Cross Street, in all probability named for Henry Cross. Although, father and son continued to make lace in the decade following the collapse of trade at the end of the 1820s, it seems this was on an increasingly reduced scale and, eventually, both were to move away from Villa Street and leave the lace trade. By the time of his death in 1842, Henry senior had began to work as a baker, a trade that he was following in 1839, when his daughter Millicent (c1812-1881) married John Frettingham, a son of George Frettingham the local market gardener 69. In 1843, another daughter, Rebecca Cross (c1818-1885), married John Frettingham's brother Henry 70. The Frettingham and Cross families were long time members of the local Baptist community, whose chapel was erected on land adjacent to the Frettingham nursery gardens on Moore Gate. By 1841, it appears that Henry junior had moved briefly to Leicester 71 but returned following the death of his wife. In 1851 he was still working as a lace maker 72 but it appears then that he, along with his mother and brother Samuel, he later lived and worked in association with the Frettingham family and ceased to be associated with the lace trade. By 1861 73 he was earning is living as a flower seller and his brother (who had previously worked as a 'lace agent') was working as a gardener, presumably with the Frettinghams. It seems that the experiences of this family, amply demonstrate the effect of the boom and bust years experienced in the lace trade in the 1820s. James Cross - was born in 1784, the son of James and Sarah (née Whitehead), and was the cousin of Henry Cross senior, whose life as a lace maker is outlined above 74. James worked as a blacksmith and, it seems, was one of many with these skills who turned his hand to making lace machines during the boom years of the 1820s and it is therefore very likely that he was the source of Henry's six machines. James was still working as a blacksmith up to his death in 1846 and appears to have been largely unscathed by the fallout of the turmoil in the lace trade. His eldest son Samuel (1808-1888) 75, who had worked with his father as a blacksmith, had turned his attention entirely to building lace machines by 1861 76 and continued to do so until his death, albeit in nearby Long Eaton 77, where the lace trade was also expanding greatly. James' daughter, Mary Ann Cross (b. 1816) married Thomas Thornhill 78, a lace maker and son of Robert Thornhill whose involvement in the early lace trade is outlined above. Samuel's son James (1831-1872) continued to work alongside his father in Long Eaton before his early death there, aged 41 79. In turn, at least two of his sons continued in the trade. These were just a few amongst many pioneers in these early days of the lace making in Beeston up to 1850, a period during which the trade had developed and begun to mature to become a major part of the industry in the Nottingham area. Eventually, as we shall see, it was to grow much further, even to compete directly in world-wide markets, but, it is now appropriate to demonstrate - using the census returns for 1841 (despite its limitations 80 ) and 1851 - just how important lace making had already become to the local economy. Change 226 740 246 . 64 18 . % Change 8.1 74.8 136.7 . 12.6 14.6 . It is clear from this table that, by 1851, about a quarter of Beeston's working population and a similar proportion of households, derived their income from the industry - albeit with with some imbalances, since those working in the industry were disproportionately male, a trend that was to continue with lace machines operated almost exclusively by men, while women worked on ancillary operation, such as winding and mending. In 1851, only 128 (30.0%) of the lace makers in the working population were female. Females working in all other occupations numbered 606 which was 46.5% of the total. Only 25 females were recorded as working in the lace trade in 1841, although this is probably distorted by the under-recording of occupations of those who were not the head of a household. Twenty Years of Decline - The stablisation and tentative growth in the lace industry following the crisis of 1829 was, as we have seen, certainly evident in Beeston and this had played its part in the increase in population numbers. However, this was not to last. After 1851, the effect of mechanisation of lace machines began to bite, as smaller operators found difficulty in responding and competing. This was a change that Nottingham itself was able to respond to more ably and much more of the activity in the trade began to be transferred there. Despite his commitment to mechanisation, as we have seen, Felkin's Beeston business failed in 1864 with the loss of close to 100 working machines and the employment that went with them. The other mechanised Beeston factory - Kirklands - continued throughout this period, now under the control of Henry's son, William Kirkland but, again as we have seen, on a steadily diminishing scale. Smaller operators - often working just one or two machines, were hit badly and many became discouraged during this time - with the notable exception of Thomas Pollard and his energetic son, John who continued, for the time being on a small scale, in the Villa Street, Cross Street area of Beeston and, as we shall see, survived to later become major players in the trade. Change 1851-71 119 -142 -162 . 101 -17 . % Change 3.9 -8.2 -38.0 . 17.6 -12.1 . This table, showing aspects of the population of Beeston and the number of lace makers over this period, demonstrates clearly largely stagnant population growth - only 3.9% - with a 38% drop in the number of lacemakers clearly making a substantial contribution to the overall standstill. Interestingly, however, the number of working heads of household increased more markedly (up 17.6%) - that is, relatively more families were forming - which points to a population that is consolidating and aging. Alongside this, the number of these heads - that is, the main family earners, usually male - working in the lace trade saw only a small numeric decline, perhaps indicating the relative survival of a core of skilled, better quality, traditionally male jobs in the industry. Alongside this, the number of female workers in the lace trade - traditionally working in support roles to the male lace makers - saw a disproportinate decrease in Beeston - down 43% between 1851 to 1871. The lace making trade - and therefore Beeston - was clearly drifting. However, happily, two entreprenours with other ideas were soon to emerge and were to change things dramatically and, together with other initiatives, were to transform Beeston's economy almost overnight. Change 1871-91 3810 1363 539 . 585 128 . % Change 121.5 85.9 204.2 . 86.9 103.2 . While, as the more detailed figures show, this growth arose from various factors, it is the lace industry that concerns us here - and the figures were very significant. By 1891 the numbers employed in the industry had almost doubled since the previous high in 1851 and had more than tripled since the low point of 1871. By 1891, over 27% of the working population were employed in the lace trade, including a significant increase in the involvement of women and girls. The lace trade had become hugely important to Beeston's economy and it is time to look at the individuals that led this turnaround. John Pollard - the story of the Pollard family and its contribution to the lace making industry in Beeston has been told comprehensively by Ernest Pollard in his book, 'Pollards of Beeston - a Century of Lace Making'. As this book also appears on this site here, it is not necessary to retell the story - other than to put it in the context of our narrative. This story of enterprise, involving four generations of the Pollard family, arose from very humble origins during the pre-1851 era when, as we have seen, the trade was carried out, in the main, by individual lace makers or small groups working together and who were only tentatively beginning to move to a factory environment and mechanisation. While it was Thomas Pollard (1803-1880) that put in place the foundation of this family enterprise in that early era, it was his son, John Pollard. who took the business to the success story that it became. Significantly, this change coincided with the two decades of particularly significant growth that we have identified. It was a change that formed the basis of a major enterprise that was to continue through the next two generations until the decline of the trade generally saw its eventual closure. However, although it remained his primary activity, he did not confine himself solely to making lace. He was also, of course, well aware that much of the remainder of the trade was carried out in the traditional way, by lace makers working on their own or in very small groups but, increasingly, they lacked the space required for increasingly large machines and flexibility in their existing work areas - often still associated with residential buildings. He therefore set out to cater for - and, of course, profit from - this need, by renting individual machine spaces - known as 'standings' - with access to steam power, within his factory complex. 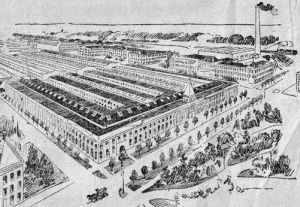 He already had a few tenants in his existing buildings when, between 1884 and 1886 he built a large new factory building in the remaining space of the complex, specifically for the purpose of renting space to others in the trade. It was successful from the start, essentially consolidating and bringing together many of the smaller operators - although each would have carefully guarded their individual business secrets. His advertisement (shown here from September 1886), which appeared in the local paper for several months, appears to have had good results and the building was soon well utilised. By 1887 he already had 21 tenants, almost all of them in the lace trade, and there were many others to follow. The building itself stood prominently on Wollaton Road, with the name "Swiss Mills" and John's initials and the year ("18JP86") showing just below the gable at that end. It can be seen on the right in the picture (shown left), the tallest in the complex. What was Dobson's Mill is glimpsed on the left of the picture. 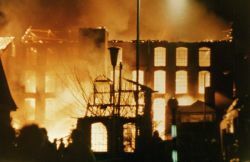 The main Swiss Mill building, in particular, remained a familiar landmark in Beeston for almost 100 years until it was destroyed in a spectacular fire in 1984. In his lifetime, John Pollard built and moved his family to Cromwell House, a then fashionable home with formal gardens, away from the factory, the north of what is now Abbey Road and beyond the end of what is now Cyprus Avenue. By the time of his death in July 1803, he had made a considerable fortune - over £25,000, which would have the purchasing power of over £6million today. This had been achieved by demonstrating excellence in his firm's lace and the foresight to provide for the needs of the wider lace making trade. He had also trained his surviving son, Arthur James Pollard, to continue to manage the business as part of a trust which continued until John's wife's death in 1922 - a story that we will include later in the context of that later era. Nevilles Factory - the Leavers lace maker, William Neville (1847-1926 81), the son of William Neville, a lace agent, and Mary Ann, his wife, had moved from Basford to Beeston and started in business as a Pollard tenant in the Bank Factory by 1871, employing nine men 82. During the following decade, he was joined by his brother, Charles Neville(1849-1918 83) and, in 1880, they built a new lace factory, just beyond the Chilwell boundary, butting up to the south side of High Road, Chilwell and alongside Factory Lane. This substantial building was 40ft wide with four storeys, each with ten 8ft 4in wide standings and topped by a 30ft lantern roof, forming a room that was used for bobbin winding and similar operations 84. By 1881, they were employing 41 men and 17 females, between there and their Beeston factory 85. In 1886, they extended their factory by adding a wing at a right-angle to the original, inside the Beeston boundary, on the south side of Chilwell Road, Beeston, on the corner of Wilmot Lane. This building housed five standings, each 8ft 6in wide, on each of the four storeys, also with a lantern roof. The two buildings together formed an L-shaped - as can be seen in the picture, shown right - joined along the Beeston/Chilwell boundary. A building of this size was clearly intended to attract lace maker tenants as well as to house the Nevilles' growing lace making operation. Interestingly, it was a contemporary and direct competitor of Pollards' Swiss Mill and it is clear that the demand was there as, by 1894, at least eleven lace making tenants were operating there 86 and some were occupying converted cottages on Wilmot Lane for drafting and designing. In 1906, the complex was further extended by adding a single-storey building, 45ft wide, housing seven 9ft 6in bays, behind the original building and alongside Factory Lane. This is believed to have been built for Arthur Metheringham, one of the Nevilles' lace making tenants. The Nevilles had an interesting family connection with the famous economist John Maynard Keynes which is described in some detail here. Although that story was complicated by the family's then dedication to Congregationalism, both William and Charles Neville were active Baptists and thus part of a tradition of lace entrepreneurs within the Beeston Baptist community. Both became Trustees of the Beeston chapel in 1885 and remained so until their respective deaths. William was a contributor, along with Benjamin Venn and Charles Pearson, when Venn Hall was built, as an adjunct to the Union Chapel on Dovecote Lane, Beeston in about 1888 87. The Neville brothers had settled in adjacent houses on Park Road, Chilwell, long before their respective deaths, Charles in 1918, followed by William in 1926. After this, it seems the buildings, appear to have been managed by Charles' son Ralph who continued to live in the family home, both before and after his marriage to Gladys Evelyn Clarke in 1932 88. During this period, the factory continued to be occupied by lace trade tenants though probably, as in Beeston, with an increasing number of other trades coming in as the lace trade faced increasing difficulties in the inter-war period. One such early tenant was the tool maker, Johnson Brothers, who were operating from the factory by 1922 and, in 1934, the firm that was to eventually to take over the whole factory, started up in the lantern space. This was the well known lathe manufacturers, Myford Engineering Limited founded by Cecil Moore (1889-1977 89), who had himself worked as a lace maker in his earlier years. Eventually, by the 1950s, this firm had become the sole occupier and the building became widely known as 'Myford's Factory'. This move towards engineering use may well have been inspired by Ralph Neville. Although Ralph had trained as a lace draughtsman, he developed a life-long interest in engineering, especially after serving, as a 2nd Lieutenant with the Notts & Derby Regiment. In March 1918, he was discharged after suffering shell shock and spent over a year convalescing, during which time his father died and after which, it seems, he did not return to the lace trade 90. There is an excellent account of Ralph's interest in engineering and an insight into aspects of Nevilles Factory in Jack Martin's memories which can be seen here. The Wilkinson Family - originated from Hucknall Torkard, Nottinghamshire where three generations had worked as framework knitters. In Beeston terms, the best known of the youngest generation was Francis (Frank) Wilkinson, a remarkable man, a brilliant entrepreneur, who played a major part in transforming Beeston's economy in the latter decades of the 19th century - and shaking up the lace trade in the process. In some ways, his background was similar to that of John Pollard as he too was able to develop skills first acquired by his father and, in his case, his grandfather. Francis was born in Hucknall Torkard, Nottinghamshire in 1844, the youngest of five children born to Michael & Elizabeth (née Harrison) Wilkinson. Both Michael Wilkinson (1809-1880) and his father, George Wilkinson (1784-1855 91) were framework knitters at a time when the trade generally, not least in Hucknall where they lived, was badly in decline. George, who had moved to Hucknall from Melbourne, Derbyshire, along with, it seems, a number of prominent knitters, had done better than most and, by 1841, he had about 60 knitters working for him - though, by that time, the trade generally was particularly badly hit. Michael Wilkinson, with a wife and family of five to support, appears to have made every effort, and with some success, to rise above the poverty which had permeated the hosiery knitting trade 92. In the late 1840s he tried moving to Radford, then expanding into its suburb Hyson Green, where he may have found more steady work. In 1852, however, there had been a significant change in prospects in Hucknall when a group of experienced knitters, including Michael, had been able to modify their frames to produce knitted falls in wool in the style of Shetland shawls, a product that offered a new life to the trade. Michael moved back to Hucknall where, for almost twenty years he and his two eldest sons were able to prosper in this new line of business. During these years, Francis Wilkinson, had set out to develop a career of his own 93. After a short time as a grocer's assistant in Nottingham, he found work - and vital experience - in the fast-growing lace trade in Nottingham. Eager to branch out on his own, he found an opportunity in what was then known as 'New Chilwell', an area adjacent to, and just beyond the Beeston boundary. There, in 1870, he was able to acquire the remains of a building known as 'Chambers Factory' where the lace maker James Chambers had operated a few machines as early as 1844, but was now abandoned and derelict following a fire. Over the next 25 years, the site, clustered around the Chequers Inn and taking in Wilmot Lane, Middle Lane and Factory Lane, would be developed greatly, to form Hall Croft Works. At first, the firm concentrated on the still fashionable knitted shawl trade and Michael moved to Chilwell to oversee production and an increasing number of knitters left Hucknall to join him there - a trend that was to continue as the business grew. By this time, Francis - usually known as 'Frank', a name we will use - had himself moved to Middle Lane, Chilwell although, at this stage his personal life appears to have been somewhat behind his fast-moving business life as his marriage to Elizabeth Brett Stephenson 94, with whom he was living, and with their two children, at the time of the 1871 Census 95, did not take place until towards the end of 1872, around the time of the birth of their third child 96. Charlotte Wilkinson - their eldest child, was born in Hucknall in 1832. In 1855 she married John Joseph James, a Radford lace maker. By 1891, he was working as a lace curtain maker at the Draycott factory. Each of their sons, Charles (b. 1856) and George (b. 1858), worked as lace curtain makers at the Beeston factory. George was living with, and apprenticed to, Francis and Elizabeth at the time of the 1871 census 95, did not take place until towards the end of 1872, around the time of the birth of their third child 97. Hannah Wilkinson - their second child, born in Hucknall in 1834, was the exception in that she does not appear to have become associated with Francis's enterprises. After 1861, when she was living in Radford, she has not been traced. Samuel Wilkinson - was their eldest son. He was born in Hucknall in 1836 and learnt to knit on the frame as an apprentice to his grandfather, afterwards working as a knitter in Hucknall and was one of those who converted to knitting shawls. By 1871 he had nine employees working in Watnall Lane, Hucknall, By 1881 however, he had joined the Chilwell operation as foreman of the woollen shawl factory. He died in 1889 leaving only £15. He and his wife Sarah (née Marriott) had at least 11 children including four sons, each of whom worked in the lace trade. Two of them, Charles and Ernest, left for America to work at the lace factory in Zion City (which will be discussed fully later). George Wilkinson - their second son, born in Hucknall in 1841, started his working life in much the same way as his older brother. Like him, he was manufacturing shawls in Hucknall with 11 employees, by 1871. By 1881 he had moved to Beeston but, in contrast to others in the family, involved himself in business opportunities which arose indirectly from the success of the Wilkinson enterprise in Beeston. Eventually, as we will see, of all of the brothers, he was to achieve the greatest long-term financial success. A first, he kept the Durham Ox public house on Beeston's High Road but also began to build houses for the growing workforce in Beeston, including the rows of terraced housing that remain a feature today around the centre of Beeston, such as those on Commercial Avenue, Wilkinson Avenue, Derby Street and City Road. He also served as a Councilor on the then Beeston Urban District Council. This detachment from the mainstream of the family business while, at the same time, being in a position to benefit from the growth in the local economy that it had helped to generate, served George well. This independence placed him in a key position when his brother Francis was clearly financially stretched in the 1890s, it was he that took charge after his brother's death in 1897 and, when it was clear that the business would not be viable without his brother's driving personality, he ensured the relatively orderly closure of the business. This part of the story will follow in its natural position in the narrative. Not all of Frank Wilkinson’s group of senior employees were family. Given that he had the same surname, it is usually assumed that Walter Wilkinson, who developed the market for the firm’s products in America, was related to Francis and they have sometimes been described as brothers. In fact, this was not the case. Walter was born in 1851 in High Hoyland, Yorkshire, the son of farmer John Wilkinson and Sarah his first wife and, perhaps remarkably, there appears to be no family relationship of any kind. However, both men became key to the success of the business from its early days up until Walter's untimely death in 1893. The story of Walter and his remarkable wife Emily deserves to be told it its own right and will be included in its natural place in the narrative. 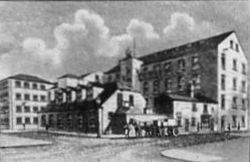 Anglo-Scotian Mills - In about 1874, Frank Wilkinson made his next move when he acquired the factory site in Beeston, north of the village centre on what is now the corner of Wollaton Road & Albion Street, where the Felkin family had previously operated. It was a move that was to change Beeston dramatically and to provide more that twenty years of employment and prosperity - but not without some dramatic setbacks, as we shall see. Up to that time, almost all lace firms in the Nottingham area, big and small, confined themselves to their own part of the overall production and marketing processes. Those firms that made the lace would often pass on their product to specialist firms for finishing and marketing would be handled by specialist merchants and agents. Increasingly, by the time we are now considering, marketing involved the development and management of export markets. By this date too, the Lace Market in Nottingham was the centre for most of the merchanting functions, taking product from lace producers and finishers around the region. Although there were, of course, some firms that carried out several parts of these processes, this was not the general rule with many content to concentrate on their own expertise and benefited from the relatively smooth cash flow resulting from middle men taking their product. Frank Wilkinson was not, however, content with that type of structure and was determined to set up an organisation which would integrate all processes - from designing to marketing - under one roof. And, his ambition was even more daring. Not content with one line of product he took on more - first adding lace curtains to the shetland shawls that he had produced successfully at Chilwell - and eventually on three sites - and then adding hosiery manufacture, all part of the integrated organisation. It took a dedicated and driven person to create such an organisation and to make it an undoubted success and Frank Wilkinson was to prove that he was that person. His success was to prove hugely beneficial to Beeston as it entered a period of growing maturity as a town. An enterprise such as this needed considerable factory space and Frank immediately set about enlarging the small abandoned factory on the site, first adding about 70 feet at the back and later an extension to the front with 300 feet facing onto Wollaton Road. Still later he added a further wing, 120 feet long, running towards The Poplars on the north side. By 1885, when a further substantial unit was added at the rear of the site, the complex extended over two acres and production was at its height. The machines, 60 curtain lace machines, 45 warp machines and 70 shawl frames, operating on two shifts, were positioned throughout the ground floor. Winding and finishing took place on the next floor while, above that, a warehouse held large stocks of finished goods destined for both the domestic and overseas markets, while lace dressing - transforming the raw lace to a marketable product - took place in the upper storey under a lantern roof. Also within this comprehensive manufacturing complex were design offices, seeking constantly to produce the patterns that would keep ahead of the competition and attract a demanding market. Of course, too, an organisation of this size also needed a strong management structure and administration - needs not always appreciated by strong personalities, such as Wilkinson, who had grown a business from small beginnings. It seems though that the business that Wilkinson had created had all the right ingredients for success not least of which were his own undoubted energy and entrepreneurial skills. Indeed, his personal energy and dedication were legendry with no aspect of the business escaping his attention and personal involvement. He himself took responsibility for developing sales to the home market and, when he was injured in a railway accident, he continued to travel the country on crutches. He applied his inventive mind to developing and improving the buildings and the machinery and processes that were used in them. And, whenever he was in Beeston, no day was complete without his personal supervision of the packages leaving the railway station. But, on 20th April 1886, just as all was in place and business was going well, tragedy struck 101. At 2.30 in the morning, the night watchman, quickly joined by two other over-night workers, discovered a fire in the building, sounded the alarm and sent for Wilkinson and his manager, Mr Jones. Quickly realising that the available hoses were inadequate and that the fire was spreading rapidly, they called out the local fire brigade but its equipment was not up to the task, the fire now having developed rapidly. The next option was to awake the postmaster who sent a telegram to the Nottingham brigade for assistance. By now, half an hour had passed and there was another 45 minute delay while horses were found. The brigade finally arrived at 4.30. In the meantime, the roof had fallen in and the building was past saving and the brigade assistance was limited to saving surrounding houses. The fire continued to rage all night with walls crashing down causing damage to surrounding buildings. It was a scene of utter destruction with everything on the site ruined. Not surprisingly, the tremendous fire had attracted crowds of onlookers from all around the area, many - particularly those who worked at the factory - realising that it was a disaster for the village and, in many cases, for their own and their families' livelihood. Estimates of the number affected directly by the disaster, which appeared in the papers at the time, suggested that some 600 had worked at the factory and there were about 400 outworkers who were directly reliant on the factory - seemingly high estimates made at the time which would have included workers from outside of Beeston. The value of the buildings lost was eventually valued at between £100,000 and £150,000 and the machines at £40,000 to £50,000. It was clearly going to be a difficult time as, although it appears that Wilkinson was insured, at least in part, things clearly could not be restored quickly - but this would be to underestimate Frank Wilkinson who on the next day, stood defiantly in the ruins (see above right, click here or the image for more). Frank responded to this huge setback with his characteristic decisiveness, by transferring the majority of the curtain manufacturing to his Hall Croft factory in Chilwell - which he enlarged substantially to provide the necessary workspace - and opening another factory in Borrowash, Derbyshire while, at the same time, starting to rebuild the Beeston site. Gradually, over the next five years, curtain manufacturing returned to the Beeston site although the other sites continued, providing a degree of insurance against another disaster - it was, as we will see, just as well that this policy was followed. The export market, particularly in America, remained an important component of Wilkinson's business. The demand for his fashionable curtains in the States was substantial and increasing - a situation that did not sit well amongst those in the States who believed that reliance on foreign imports did little for their home economy. Although it was a bitterly contested move, in October 1890, the McKinley Tariff Act became law. This increased the tariffs on a range of goods coming into the States - for lace, the tariff was increased from 40% to 60%. This was clearly another threat to Wilkinson's business but, once again, he responded decisively by paying $120,000 for a vacant mill and associated empty tenements in Tariffville, Connecticut. This was a substantial outlay, given the costs of rebuilding he had faced, not all of which had been covered by insurance. He was, however, able to use the excellent relationship with his bank - Nottingham & District Bank - which, in June 1890, granted him an overdraft facility of £30,000 against security he lodged with the bank, to be reduced by £5,000 per annum after two years. It was also agreed that, should an additional £5,000 be required for a special purpose, the bank's Board would give the application their 'most favourable consideration'. Walter Wilkinson - who, as we have already seen, was not related to Frank, was made Vice-President. Walter had served Frank well as his export salesman and made many visits to America over the years and had undoubtedly ensured the success of Frank's Beeston products in America so far. 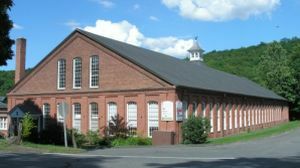 It seems likely that it was he that put together the deal for the acquisition of the Tariffville mill and would have expected - and had probably obtained, possibly after some financial commitment - a share in its future prosperity. Frederic Jones - was made the assistant Treasurer and General Manager. This is the same 'Mr Jones' who, as Manager of Anglo-Scotian Mills in 1886, had raised the alarm when the fire was first discovered there. He had gone on to become manager of Frank's mill at Borrowash before this latest appointment, charged with managing the detail of getting the Tariffville mill up and running and then managing the day-to-day manufacturing process. He and his wife Henrietta - a daughter of Beeston farmer, Francis Burrows - had arrived in New York on 2 June 1891 and had taken up residence in the township associated with the mill. Then just 30 years of age, he had clearly already impressed Frank with his energy and business enterprise - qualities that were also recognised by local observers in America. Hubert de Tracy Wilkinson - Frank's eldest son, was appointed Secretary. Hubert, then aged 21 and unmarried, had previously assisted his father in managing the mills in Beeston and Chilwell and had arrived in America on 24 August 1891. Frank Wilkinson made a visit, no doubt to oversee progress, arriving at New York on 7 September 1891 103. His arrival so soon after that of his son is interesting but not presently explained. Emma Marriott and her daughter Florence Edith Marriott - Emma Cutts was born in Chilwell in 1839 and married Frederick Marriott in 1860. Florence Edith was their second child, born in 1871, after which Frederick appears to have left the marital home to lead a new life in Radford and Nottingham. Emma worked at Wilkinson's Chilwell factory, eventually as an overlooker, living in the factory complex on Middle Lane, Chilwell. By the time she arrived in America, with her daughter in 1891, she has reverted to her maiden name. George William Wakeling - was born in Sneinton, Nottingham in 1869 and had worked at the Beeston factory as a lace maker before moving to America in 1892. Soon after his arrival, he married Florence Edith Marriott (see above) and they were to have five children with her mother, Emma Cutts, continuing to live with the family thoughout the rest of her life. Joseph Wright and his sons, James and Wilfred - who arrived in 1892, had each worked at the Beeston factory while living nearby at 73 Wollaton Road. Joseph (b. Beeston, 1839) and Wilfred (b. Chilwell, 1875), had both worked as lace dressers and continued in that role at the Tariffville mill. James (b. Beeston, 1868), was able to continue in his work as a lace maker. Mary Ann Towle - who, prior to her arrival in 1891, had worked as a lace mender, living at 59 Wollaton Road, Beeston with her parents, Edmund Towle and his wife Amelia (née Eaton). She married James Wright (see above) in about 1896 and they went on to have five children. Meanwhile, the rebuilding of the Beeston site had been completed sufficiently enough to allow production to get underway and, in fact, the factory was often working day and night. On 29 April 1892, however, came another huge setback when it was again severely damaged by fire - exactly six years to the day since the first fire. At just after midnight, when a shift had just finished and many workers were still in the building, one of the twisthands had stayed on to prepare his machine for his colleague who would start his shift at 4am. While using a moveable gas burner to provide illumination while positioning threads, it seems he accidentally set fire to flammable material and this quickly spread, despite the man's every effort to contain the fire. Within ten minutes the fire had spread alarmingly and the workmen rushed to escape, luckily with no major casualties. The building where the fire had started was part of the newly erected buildings on the south side of the site, to the right of a gateway standing at the top of Villa Street. It was five stories high and, although the local fire brigade was quickly on the scene, they found the fire had already spread from the bottom to the top of the building and to adjoining stockrooms and Frank Wilkinson's private office. Clearly, the task was far beyond what they were able to tackle unaided and help was quickly summoned from Nottingham and other brigades in the area. They were able to fight the fire and prevent it spreading widely thanks to an adequate pressure in the local water main, helped by extra pressure supplied from the Basford pumping station. 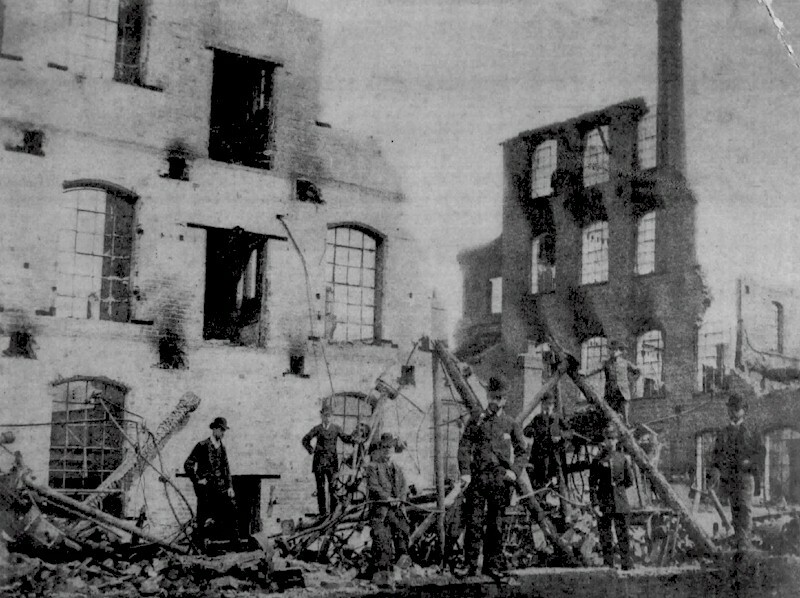 Workmen from the factory, led by George Wilkinson and assisted by local works firemen, worked assiduously to restrict the fire spreading and to remove whatever stock and machinery they could. Eventually, the building where the fire originated collapsed, destroying other buildings on the left of the gateway. But, by daybreak, the fire was under control and the substantial losses could be evaluated - they included eight curtain lace machines, four Leavers lace machines, 250 curtain taping machines and a complete lithographic and letterpress printing plant. Finished stock - mainly curtains - valued at £30,000 and cotton stock worth £10,000 was lost. In all the loss would be over £100,000 - and this time it was not fully insured 104. Tragically for Beeston and surrounding communities, between 500 and 600 employees were expected to be without employment until things were returned to normal - if they ever were. If Frank Wilkinson had thought, up to this time, that his problems were almost behind him, they had now got very much worse. He now faced huge pressures on many fronts - his United States factory was not yet operational, his Beeston factory was once more in ruins - with all that meant in terms of loss of production - and, this time, the loss was only partly insured. All this would almost inevitably mean his cash flow would be impacted severely and, given the investment already made, probably left him stretched financially. Happily, his relationship with his bank was, for now at least, still good, such that, in May 1892, the bank's Board agreed an additional £15,000 was to be made available against the security of his fire insurance claims. Characteristically, despite all of these issues, Frank responded immediately and decisively by commissioning a local architect, James Huckerby, to design a new factory building at the Beeston site to replace those that had been destroyed in the fire. His plans for the Anglo-Scotian Mill, that still stands today, were ready on 27 June 1892 - less than two months after the fire - and building got under way straight away. The building with its imposing castellated gothic frontage onto Wollaton Road (shown left - click the image or here to see more images of the building), which some say was modeled on Thrumpton Hall, was clearly a statement of defiance and determination to overcome any and all setbacks - and the stone shields above the central entrance dedicated this otherwise entirely practical building to its purpose - Laboremus - Let Us Do Our Work. But, it seems, his financial problems continued and were to dominate the last years of his life. By October 1892, his bank was beginning to put restrictions on his account by limiting his overdraft to £30,000 - though, in January 1893, it agreed to increase this to £40,000, against additional security. By early in 1893, during a regular sales visit to America, Walter Wilkinson found long-standing customers were beginning to withhold orders after experiencing delivery problems - understandable following the disruption of the fire but not acceptable by those who had the option to buy elsewhere. Production at the Tariffville factory could be expected to help but was not expected to be fully underway until well into 1893. Then, the workforce was expected to total 60 - sizable for a startup but small when compared with the Beeston factory - and full efficent working could not be expected for some time. This threat to Frank's key market in America - no doubt mirrored in his home market and greatly exacerbated by Walter's early death in December 1893 - added considerably to the financial problems he clearly faced. By then, his bank had clearly begun to loose confidence and took steps to safeguard its very substantial exposure to Frank - in noting that the overdraft had reached £42,848, the local manager was instructed to refuse all cheques which would increase that amount and instructed its solicitors to write to Frank accordingly. Nevertheless, Frank continued to confront these problems head-on, looking for any way to get through these set-backs to the more stable situation promised by the initiatives he had already put in place but which needed time to show benefits. What was clear however, was that, except for some relatively small advances granted against specific assets, he could no longer depend on the bank for further support. In more prosperous times, Frank had begun to put together a portfolio of investment properties, quite apart from his substantial factory properties. These included 'The Towers', the substantial property with frontages on City Road, Nether Street and Middle Street and occupied by Walter Wilkinson's family, several adjoining building plots and out-buildings, all of which were adjacent to Frank's own fine residence at Beeston Hall on Middle Street. There were also residential properties in Chilwell, some with associated shops, including Hall Croft Terrace and De Tracy Villas and a residential property on Beeston High Road. He also owned building plots in the Belle Vue Estate in Beeston and more land adjacent to the station in Attenborough. This portfolio was offered for sale by Public Auction, held at the Durham Ox Inn at Beeston on 1st June 1894. It seems however, that these properties were held as security by the bank against his bank borrowings and most of the proceeds - probably a total of £1,470 for four of the properties - were received by the bank in July 1894. Similar small property proceeds were also repaid to the bank in the months up to February 1895. By this time, however, the bank was becoming even more concerned and took steps to ensure that any rental payments were collected and paid directly to the bank, to insist that agreed repayments be made on time if proceedings were to avoided, that Frank's interest in the American property be assigned to the bank and that steps be taken to obtain further security against the company's fixed machinery. Clearly, these actions provided nothing more than short-time financial fixes - they would not provide anywhere close to the level of support needed to ensure survival. One significant aspect of this is the choice of venue for the property sale - the Durham Ox - where George Wilkinson his brother, was then landlord, as it was he who now began to take a substantial role in Frank's business affairs. Up to this difficult time, George had a distinctly separate association with Anglo-Scotian, building and renting houses in the area for the workers - those surviving on Commercial Avenue, Wilkinson Avenue and Derby Street are a surviving legacy of this - and had prospered accordingly. Now, Frank and George began to act together to try to address the ongoing financial problems. George had visited America in January 1894 and, in August of that year, he and Frank paid a joint visit there to assess the situation there. Also in that year they floated Anglo Scotian Company Ltd as a vehicle to take-over and refinance the Beeston business - though, perhaps because of existing encumbrances with the bank, it appears that, at this stage, the mill property itself was only leased by the new company. However, with a share capital of £52k, £25k of which was paid-up, and a debenture issue of £52k, it was able to attract investors, many of whom were from the Newcastle-on-Tyne area. George became a Director and was to take an important and increasing part in the running of the company from that point on. The last few years, particularly since the time of the second fire in 1892, had been a very difficult time for Frank and it is not surprising that, it seems, his health was beginning to deteriorate - the image (above right) taken in the garden of his home at Beeston Hall at around this time, certainly seems to show this. In July 1897, while on a business visit to London, he was taken ill and forced to return home immediately where doctors confirmed that he was seriously ill and unlikely to recover. He died on 11 August 1897, at his home in Beeston, aged only 52. Despite the fortune he had made at the height of his career, he left a relatively modest estate - £3075, later revised to £1302. But he remained a highly respected man who, despite many reverses, had done much to transform and improve the fortunes of Beeston's industrial life and the lace trade generally. 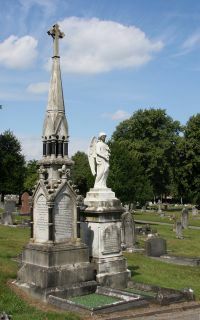 His impressive memorial, stands prominently within a group of family monuments in Beeston Cemetery (Shown left - click here or the image for more) and remains a reminder of this contribution to Beeston's growth and prosperity. The local newspaper had no doubts when it wrote that he was 'one of the best friends Beeston ever had'. Francis Wilkinson - was born in Chilwell, Notts in 1869. In 1881 he appears to be attending a boarding school on the Ropewalk in Nottingham but, after that, no trace has been found until his early death, apparently at Beeston in January 1904, aged 35. He is buried in Beeston Cemetery with his parents. Hubert de Tracy Wilkinson - was born in Chilwell, Notts in 1870. As a child, aged 10, he boarded at Hallcroft Terrace, Chilwell, Notts with Frances S E Kelsey, a school mistress, together with brothers Neville and Cecil. As a young man he worked alongside his father as a lace curtain manufacturer and, as we have seen, went to America for a short time, helping to set-up the Tariffville factory. In 1895, he married Mary Elizabeth Fazakerley, the eldest daughter of the late Edward Fazakerley, a successful Nottingham draper, and his wife Elizabeth Jane, and set-up home at Melton House, West Bridgford, Notts. A son, Kenneth de Tracy Wilkinson was born in Nottingham in 1898, although, it appears that for much of his young life he lived with his maternal great-aunt, Emma Rhoades. At the time of the 1901 census, Hubert and Mary are staying at the Imperial Hydro Hotel in Blackpool with Hubert described as a lace manufacturer. In 1916 he is recorded as living at 70 Talbot Street, Nottingham but no trace of either him or his wife has been found until Hubert's death in 1941 in Nottingham. Their son worked as a cinema operator before service with the Royal Flying Corps as a mechanic during World War 1. Kenneth married Elizabeth Reynolds in 1941 and died in 1957 in Nottingham. Gertrude Ellen Wilkinson - their only daughter, was born in Chilwell in 1872 and died as an infant in 1874. Neville Percival Wilkinson - was born in Chilwell, Notts in 1874. As a child, aged 8, he boarded at Hallcroft Terrace, Chilwell, Notts with Frances S E Kelsey, a school mistress, together with brothers Hubert and Cecil. As a young man he worked as an assistant to his father and, after Frank's death, he became a cotton agent. He never married, died in 1903 at Beeston, aged 29, and is buried with his parents in Beeston Cemetery. Cecil Walter Wilkinson - was born in Chilwell, Notts in 1876 but, for some reason, he was baptised at St Leonards Church, Newark, Notts in 1888. As a child, aged 4, he boarded at Hallcroft Terrace, Chilwell, Notts with Frances S E Kelsey, a school mistress, together with brothers Hubert and Neville. In 1899 he married Clara Georgina Underwood and then worked as a commercial clerk and later as a cashier for a shawl factory, living at 211 Station Road, Beeston. He died in 1916, aged 39, by which time he and his family were living at Stafford House, Park Street, Beeston. They had one daughter, Muriel Clare Wilkinson (1902-1991) who never married. His wife died in 1958 and is buried with her husband, in Beeston Cemetery, adjacent to the large memorials to Frank and George. For the time being, the mills in Beeston, Chilwell, Draycott and Tariffville continued to operate under George Wilkinson's management but market conditions - particularly in the increasingly competitive American market - continued to be difficult. 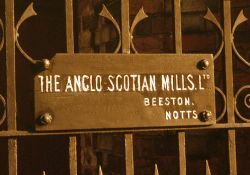 Labour relations problems in the Beeston and Draycott mills, arising from attempts to unionise the workforce, had started by 1898 and continued as a significant issue for the rest of the life of these factories. However, by July 1899 it had been possible to repay all monies due to the bank, apparently by continuing the sell off some peripheral assets and the transfer of all the main factory assets in Britain to the operating company, Anglo Scotian Company Ltd.
During a visit to America by George in 1898, a decision was taken to discontinue production there, following which the Tariffville mill was taken over by Frederick Jones who was able to continue lace production, under the name 'Tariffville Lace Company' until 1910 when he started the Tariffville Oxygen & Chemical Company on the site. At that time, many of the lacemakers, including those who had originated from the Beeston area, moved to Chester, Delaware County, Pennsylvania where an active lace factory continued for many years. Over the next eight years, the trading position of Anglo Scotian Company Ltd deteriorated, such that, in October 1906, a Receiver was appointed, charged with liquidating the assets for the benefit of the company's investors - mainly men of standing from the Newcastle-on-Tyne area - and its creditors - happily, relatively small in value. It was likely to be a big task - as well as the Beeston factory, there were 35 lace machines and a large stock of yarn and finished items that, it was hoped, would go some way to meeting the company's liabilities of about £100k. When early attempts to sell the company as a going concern failed, these assets were sold to those making the best offer and, by the following year, curtain stock at bargain prices was being offered - as the advert (right) from May 1907 from the Hull Daily Mail shows. The mill site proved to be more difficult to sell and the liquidators added improvements - including an additional steam engine - to make it more attractive to a purchaser. Eventually, the whole complex, covering 8120 square yards, complete with existing tenants, was sold to Arthur Pollard, the latest to run the family lace business at nearby Swiss Mills. At £8,500, it was a considerable bargain as the existing tenants were paying a total of nearly £1800 per annum in rent and there was potential for another £1000 from the vacant rooms. After some additional improvements - notably, conversion to electrical power - Pollard was able to operate it successfully at least for the time being, in much the same way as Swiss Mill - mostly with lace making tenants but with a few of his own machines. The company nameplate from that era (shown left) survived on the gate at the top of Villa Street until into the 1980s although, by then, the site as a whole had seen further significant changes in ownership. In about 1923, one of the tenants, the curtain manufacturer A & F H Parkes, purchased the front part of the factory (which included the striking facade on Wollaton Road) and it became known locally as 'Parkes Factory' - a name that will be remembered by many and still used today by some in Beeston. Over the years, the number of lace tenants gradually declined such that, by the time the Pollard family sold the remainder of the complex in the 1960s, essentially all had left and there was then a range of tenants in a variety of other trades. By the 1960s, the main part of the factory was occupied by Ariel Pressings, manufacturing small electrical components, who continued there, including their successors, up to 2003. In 2004, yet another spectacular fire destroyed part of the complex. The site is now Grade II listed, and has been acquired and tastefully converted to residential use by the local development company, Gilbert & Hall. As we will see, it is fitting that the complex is now managed by the long-established Beeston family firm of estate agents, C P Walker. As we have already mentioned, George Wilkinson, Frank's brother, built many of the residential buildings which provided accommodation for the Anglo-Scotian workers. Many of these terraces can still be found, particularly on Commercial and Wilkinson Avenues and on Derby Street as well as, below the High Road in the City Road/Clifton Street area. He is also believed to have built Commercial Buildings which still stands on the corner of Wollaton Road and The Square, in association with his son-in-law, the chemist, Arthur Blurton Frost, the husband of Elizabeth, George's second of three daughter's by his first wife Zipporah (b. c1843, née Foulds). After Zipporah died in 1864, George married Emily Truman (c1843-1903) and the couple had two children. Their son, Frank Wilkinson (1866-1934), traded variously as a farmer, publican and coal merchant and lived at The White House on Nether Street, a property that had been associated with The Towers which George had acquired following the sales of Frank's property in 1894 and where descendants still live today. Their daughter, Emily Wilkinson, married Charles Potter Walker (the original C P Walker), the son of Frederick George Walker (1846-1924) and Henrietta, his wife (née Cox b c1849). Sadly, Charles' mother, died within weeks of his birth in Beeston in 1873 and he was brought up by foster parents, John & Ann Cartwright, going on to start work as a clerk. After his marriage to Edna Wilkinson (1874-1956) in 1895, he started to be involved in managing the Wilkinson properties, later beginning to sell insurance while also trading as a greengrocer at 50 (now 54) High Road, Beeston, Soon - certainly by 1908 - he had opened an estate agency at 107 High Road where the company is still based today, under the management of the fourth generation of the family. Zion City - the period of disruption in the lace industry in Beeston which followed the Wilkinson difficulties, led many in the trade to look to America for an answer to their future prospects. Protectionist legislation had given communities - encouraged by campaigning local newspapers - as well as entrepreneurs and investors in the New World the confidence to drive for the development of facilities to manufacture products that had previous been imported, particularly from Great Britain which was then a supporter of free-trade, able to take advantage of its then relatively sophisticated manufacturing base to dominate trade throughout the world. Protecting the home market in America - particularly in the northern states - was seen as a sure-fire way of providing much-needed local employment but, like many quick-fixes, it didn't always work out the way it was intended and, inevitably, unexpected consequences arose. One such aberration was the rise and collapse of Zion City, a story that involved lace making in general and Beeston in particular. As we have seen, the dramatic increase in the tariff, from 40% to 60%, imposed on lace imported into the States, had an understandable impact on those manufacturers in Beeston and elsewhere who depended on exports to that major market. Wilkinson had responded by setting-up a factory in Tariffville and was praised by the local community for doing so. And, even after Wilkinson's empire collapsed, this enterprise was able to continue for another decade and similar operations were to benefit - and prosper - from the skills of the workforce. It was this specialist skill set that put the British lacemakers at an advantage and they responded, in large numbers, by moving to America. In the period up 1914, when war broke out, many Nottingham area lacemakers and their families - including many hundreds from Beeston - made the move. Rather than the bulk of the jobs that were created going to local residents, the specialist skills required for making lace meant that, at least in the early years, most of the best jobs went to these incomers. In the case of Zion City, as it turned out, it was a very fortunate that the lacemakers that were involved were in a position, at least to some degree, to control their personal outcome as a result of these specialist skills. The site of Zion City, 6600 acres north of Waukegan, Illinois, some 42 miles north of Chicago, was acquired in 1899 by John Alexander Dowie who was intent on developing a community with a theocratic political and economic structure which would attract the followers of his religious ideas. Born in Edinburgh in 1847, Dowie emigrated to Australia with his parents when he was 13 but returned for a while to study at Edinburgh University. Afterwards, he was ordained as a Congregational Minister, serving in Sydney and Melbourne, and married his cousin, Jane Dowie. He became increasingly interested in faith healing and also preached increasingly against the use of alcohol and tobacco. In 1888, he arrived in San Francisco, the first stage of a tour of the United States and Europe but, finding a ready audience for his faith-healing claims, he decided to establish his base there, eventually settling in Chicago in 1890. Over the next 10 years, his influence - and his fanaticism - grew to new heights and he gained an enthusiastic following, particularly after setting up in rented premises - widely known as "The Little Wooden Hut" - just outside the Worlds Fair in 1893. His International Divine Healing Association had already become a commercial enterprise, attracting those who would pay for the chance of a cure and now he performed "Divine Healing" before large audiences, mainly using subterfuge and phoney or gullible subjects who were planted in the audience. His organisation continued to grow throughout the Chicago area, despite a series of legal challenges from the medical profession - all of which he was able to win with the help of clever legal assistance. In 1896, he replaced the Divine Healing Association with the Christian Catholic Church in Zion. Everything was now in place for him to exploit - there now seems to other word for it - the huge following he had gained in America and, indeed, in other countries in the world. The development of Zion City was to be the means of achieving his aims - and, by this stage, his self-belief and influence over his followers were absolute. Samuel Stevenson was born in Little Eaton, Derbyshire in 1860, the third son of Gervase Stevenson, a railway worker, and his wife Ann (née Horsley, b. Beeston c1833). As a youth, Gervase had worked as a servant in the household of the surgeon, John Orton, at the Manor House in Beeston where he would have undoubtedly have come into contact with the local Methodist pioneer, Henry Kirkland, who was also then living at the Manor House with his family. He may also have encountered the local Baptist community which worshipped in the nearby chapel on Nether Street. Whatever the influence, Gervase and Ann's marriage at Beeston in 1851 marked the formation of a family that lived a devout, Non-Conformist Christian life with life-long connections to both the Baptist and, it appears, the Wesleyan Methodist chapels locally. Sadly, in 1866, Gervase died, aged only 35, leaving Ann with a family of five boys under 14. The family lived for a time in Nottingham where Samuel started work as a lace maker but, by the time that Samuel married Eliza Lomas in Beeston in 1886, he had established himself as a lace manufacturer, in partnership with a Mr Towle (possibly Edmund Towle or one of his sons), operating from standings in Swiss Mills, Beeston. The couple had one child, a son, Lomas Oswald Stevenson, before Eliza's, premature death, aged only 29, in 1890. Samuel, apparently at that stage a Wesleyan Methodist, read about Dowie and his professed faith-healing abilities in about 1895 after a copy of Dowie's "The Leaves of Healing" came into his possession. This weekly newsletter was started in 1894 and had already begun to be circulated around the world, eventually reaching a circulation of 40,000. By this stage, Stevenson had prospered in his business, such that he was living at 73 Imperial Road, Beeston, in the newly-built and fashionable Imperial Park with his son and his father-in-law, James Lomas, and with the help of a housekeeper and another domestic servant. Lomas, then a widower and also a lace manufacturer, was a long-time member of the local Wesleyan Methodist Church and would, in all probability, been a catalyst to Stevenson's developing belief in faith-healing which occurred over the next few years. By the beginning of 1900, Dowie unveiled his plans for Zion City, dedicated to God, where his followers could live according to his beliefs. In January 1890, Stevenson's belief in Dowie was such that he made the journey to America to see the plans for himself. During a visit to Dowie's grand home - 'Ben MacDhui' in Montague, Michigan - a plan was agreed that was to lead to Stevenson moving to Zion, together with his lace machines as well a core workforce of Beeston area lace workers. A lace mill was to be set up in Zion which, under Stevenson's management, would become one of the core industries to drive the Zion economy. A price of $150,000 was agreed for the machines, patterns and goodwill, of which $50,000 was to be in cash and the rest in shares in the lace mill company. Although this appeared to be a deal that was satisfactory to Stevenson, as it turned out, he had not allowed for Dowie's ability to arrange things in his favour. Sensing Stevenson's feelings for his wife's sister, Mary Ann Dowie, Dowie encouraged the match, agreeing a dowry of $50,000, payable to him 'as her guardian'. Dowie had effectively acquired the business with no up-front payment. The couple married in August 1900. Meanwhile, in July, a large number of followers arrived at Zion for a ceremony that dedicated it to God and to take part in the laying out of the City. In a staged re-signing of his agreement, Stevenson (shown right about this time) again put his name to his agreement for the mill - but this time one that had, unbeknown to him, been subtly amended. It now reflected the financial terms that were used consistently throughout Zion, where all assets - including the businesses and the bank - belonged to Dowie personally and absolutely, while followers who invested their money were issued with shares in worthless shadow companies that were not backed by the assets. But for the time being, Stevenson was unaware that he had been duped and, by now appointed a Deacon and highly thought of by Dowie, he set about making arrangements for setting up the mill and moving machines, workers and their families from Beeston. For his part, Dowie set about presenting this acquisition and his other plans for Zion City in a pamphlet entitled "The Coming City". Typically, this embroidered the truth when it stated that a whole lace mill had been acquired, a claim supported by a photograph of Pollard's Swiss Mill in Beeston - where Stevenson was just a tenant - and a series of impressive interior photographs of an unknown lace factory with a clear implication that they showed what had been acquired. Stevenson lace making expertise was - quite rightly - described in glowing terms. Immediately following the marriage, Stevenson returned to Beeston with his new wife to recruit workers and to make arrangements for moving the lace machines to Zion City. They travelled with Dowie who was visited Britain to preach and to attract more followers. Dowie's visit was largely a disaster. In London, his meetings were attended by groups of medical students who challenged his faith healing claims and he was widely ridiculed by a highly critical press. Attempts to hold meetings in Manchester and Leeds also ended in chaos or cancellation. During the visit, there had been tragic news. Mary Ann Stevenson - Samuel's wife and Dowie's wife's sister - had died of pneumonia on a ship taking her and her husband back to America. Dowie blamed Stevenson for her death and he stayed well away when Dowie returned to Chicago in the new year. This was to be the start of a breakdown in their relationship which, as we will see, was to play out over the next twelve months. But, during this time, preparations for the lace making mill in Zion continued. On 31 October 1900, the first contingent of lace makers and their families - 25 in all - left Liverpool for America on the SS Waesland traveling first-class at Dowie's expense, with the men on contracts that paid £10 a week - a then huge wage. The group included Samuel's brother Henry Stevenson with his wife, eight children and elderly mother. Also in the group was George Wilkinson - a Beeston lace maker who was, incidentally, a nephew of Frank Wilkinson - his wife and family and two of his wife's sisters. Two Nottingham lace designers, George Middleton and Henry Norwebb and their families, were also part of this initial contingent. Their arrival in Philadelphia on 12 November was the start of two weeks of drama that was eagerly played out in the press - particularly in Nottingham and Chicago. Initially, the group was refused entry and ordered to be deported when it was claimed - despite assurances that were believed to have been received before their departure - that they were in breach of the US contract labour laws, which did not allow entry for sponsored workers for existing industries, but only to supply new skills for new industries. An initial Board of Inquiry by the US Immigration Commission, ruled that lace making was not a new industry, a ruling that was upheld at an appeal on the 16th. On the 21st, the group was released after Dowie provided a security of $8,000. Finally, on the 21st, in a second appeal, Dowie's lawyers - always a formidable force and now advised by Samuel Stevenson on aspects of the lace trade - were able to successfully argue that Leavers lace making was a new industry in America, requiring new skills. They pointed out that 95% of all lace in America was imported and claimed that what existing lace making industry there was there made 'course lace' on old machines that did not compare with the fine lace that was proposed. Finally, the group of arrivals was released to complete its journey to Chicago to begin setting up in Zion. Stevenson's own eight lace machines together with four ordered from Ernest Jardine, the machine builder, were already said to have arrived. Further contingents of lacemakers, mostly with their families, arrived at Portland, Maine on 17th January 1901 on the SS Tunisian and on 26 January 1901 on the SS New England into Boston, Massachusetts. and, although examined carefully by the immigration officials, were able to enter the country without undue delay. The Portland contingent included Arthur Brothers a Sandiacre lace designer, William Brothers, Mr West, George Morris, Mr Brownlow, Mrs Allwood, Mrs Hollis and Miss Wingfield all from Nottingham, a group that included card punchers and finishers. The Boston group, included another of Samuel's brothers, Arthur Stevenson with his wife Rebecca with George Turton, Benjamin Harrison and James Wilmot, all from Beeston and each travelling with their wife and family. Joseph Marriott, a lace factory foreman from Sandiacre and his family, two Nottingham lace designers, Joseph Hazeldine & William Walker and a Nottingham lace maker, Henry Bailey. Others undoubtedly followed over the coming months - though, those back in Nottingham thought that about 48 hands would be all it would take to work Dowie's mill and it was intended that some of these would be locally trained. Initial fears that it would materially harm the Nottingham-based industry - a claim that was increasingly made by Dowie - was, for the moment at least, confidently discounted by those in the know. 1901 was an important year in Zion when, on the surface at least things began to develop and progress was made for those who had put their faith in the project. Full of confidence, Dowie declared himself to be 'Elijah the Restorer' or 'Elijah III' and dressed accordingly (see left). In July, building lots were made available and the first house was completed and occupied early in August with hundreds more following before winter set in. Those who settled there paid a high price for a 1100 year lease with strict rules as to their conduct and Dowie retaining the right to evict without compensation those who were deemed to have transgressed - and the list of forbidden items and conduct was long. Besides alcohol and tobacco, it included eating pork, medical doctors, politicians, secret societies, theatres, dancing, swearing, oysters and even tan-coloured shoes. The construction of the lace mill took much more time than was expected and the workers from the Nottingham area who had arrived at the end of 1900 were idle for some months - though continuing to be well paid - while construction of a temporary building was under way. In these early days, conditions at Zion were spartan and had little appeal to most of the lacemakers, particularly those with families and most found accommodation in nearby, more settled communities - where, incidentally, they could avoid the ban on tobacco in Zion. Dowie's own Zion residence, the Shiloh House, was on an entirely different scale, designed by Paul Burkhardt, the Swiss architect, in the the Swiss chalet style, with 25 rooms and every luxury facility. The breakdown of trust between Dowie and Samuel Stevenson, that had arisen when Dowie blamed him for his wife's death, came to a head during these months. First, Samuel was replaced as manager of the Zion lace business, a move that caused Samuel to look more critically at the financial arrangements relating to his sale to Dowie. It wasn't until June that he realised that the second document he had signed was not simply a duplicate of the original agreement between them and that, as a result, he did not hold $100,000 in shares backed by the assets of the lace factory but instead, $100,000 of worthless paper that had no backing at all. In addition, Dowie was refusing to return the $50,000 dowry he had paid. He believed, with every justification, that he had been tricked out of everything he owned. With no possibility of conciliation, he commenced legal proceedings in November 1901, alleging fraud in Dowie's business dealings, requesting the Court to appoint a receiver for the Zion lace business and an order to restrain Dowie from selling more stock in the mill company. After a hard-fought court battle, at the end of January 1902, the judge decided in favour of Stevenson, declaring that he was entitled to $100,000 from Dowie for his share in the lace industry in Zion - which he placed in receivership, valuing it at least $700,000. In deciding in this way, he accepted that Dowie had exerted undue influence over Stevenson. In the opinion of the judge, Dowie was clearly superior in both intellect and business ability and was a 'religious zealot' who was able to influence others, including Stevenson, to follow blindly. The judge ruled, that it was up to the court to protect the weak against the strong. There was no order for the repayment of the $50,000 dowry which the judge ruled could not be collected. The decision was subject to appeal but, as it turned out, within days, the parties agreed a settlement out of court and the receivership was lifted. While the amount of the settlement was not made known, it was generally believed the Stevenson received the whole of his claim. A permanent building for the Zion lace factory had now replaced the less than satisfactory temporary building that it had been forced to use in its early days - although it never reached the size and scale envisaged in the earlier artist's impression shown here, it was still huge - and now Dowie moved to strengthen its management by appointing Arthur Stevenson, Samuel's brother to be its manager. But, it wasn't long before he too began to fall out with Dowie when he could see that the glowing reports published as to the success of the business were a gross exaggeration - typical, Stevenson had realised, of the false and misleading impression of Zion's commercial prosperity that were being published in 'Leaves of Healing'. As an expert in his field, Stevenson could see clearly that things were not right. The factory had been built on far too large a scale, being capable of housing 82 lace machines when only 18 were ever used, production was often stopped when yarn was not available when bills were not paid and Stevenson was convinced that the business was three times over-capitalised. He knew that the business could not be turning a profit and that dividends must be being paid out of capital, Stevenson challenged Dowie to show him the books - which, even as manager, had been denied him. He was told to mind his own business, and, after pushing his opinion further, he was dismissed. But, no doubt emboldened by his brother's earlier legal victory, he challenged what he saw as a breach of his contract, but was required to leave the factory while continuing to be paid. It was a further blow for the long-term viability of the business - irrespective of the quality of the work it was able to produce. The fact that Zion's commercial model was not generally viable became more and more apparent over the next two years, particularly to those on the inside. Dowie called for more and more financial support, particularly from his followers, when the Zion bank - which was entirely owned and controlled by Dowie, despite a notional shadow company in which investors had put their money. This financial drain was not helped by Dowie's extravagant lifestyle - entirely financed by Zion funds - both at home - where he had two large homes, fully staffed and extravagantly furnished - and on his travels - when he always travelled first class with a supporting staff. In 1903 he ordered all his followers to mortgage any property they owned and to deposit the proceeds, together with all other cash they had, in the Zion Bank. A major crusade to New York in 1903, accompanied by 3000 followers on ten special trains found him up against an entirely uninterested but bemused public. The project had cost $300,000 and found virtually no new followers, but there was no stopping Dowie who embarked on a 'round the world' crusade to include Europe, New Zealand and Australia which was similarly expensive but largely fruitless. Plans to develop a 'Plantation Paradise' on land that he bought in Mexico, came to nothing. By now his dire financial position was clear for most people to see and steps were being taken to force an examination of his financial affairs by a petition in bankruptcy. After suffering a stroke in September 1905 he left for Jamaica to try to recover his health and granted Wilbur Glen Voliva, his chief lieutenant, a Power of Attorney and he used his powers to undertake an examination of the financial and found, as most people expected, gross financial deficiencies. It was estimated that between $2.5 and $3.4 million was unaccounted for. In April 1906, Voliva moved to depose Dowie, now supported by Dowie's wife, his son Gladstone Dowie and a clear indication of support from the majority of Zion residents. Acting under the power of attorney he held and with strong legal advice, he took possession of all Dowie's property. Although Dowie returned, despite his extreme state of health, to fight the move, he was unable to make progress. He died on 9th March 1907 in Zion, aged almost 60, defiant to the end, and was buried at Lake Mount Cemetery there. It was the end of an unforgetable era and remarkably, people from Beeston had played a key part in the drama. Samuel Stevenson : In 1902, in Manhatton, New York, he married Florence McFarland, a concert pianist who had lived previously at the Dowie Institute. The couple moved to England where a daughter, Ruth was born in the following year. In 1907, he returned briefly to America with his only son, Lomas Oswald Stevenson (b. Beeston 1887) who then attended Massachusetts Agricultural College. The couple had bought a substantial house in Radcliffe on Trent, Notts but, in April 1910, Florence was awarded a separation on grounds of cruety and returned, with her daughter, to America. Samuel went to live in Toronto, Canada and little is known of his subsequent life. Lomas become a farm superintendent in Staatsburg, New York and died in Florida in 1951. Arthur Stevenson : Is known to have attempted to set up a rival lace factory, either in Waukegan - where he canvassed for funding in September 1906 - or possibly by taking over the Zion factory. When this initiative came to nothing, he then formed The Zion Office Supply Company, which soon changed its name to National Office Supply Company and operated variously in Zion and Waukegan over the years. He died in Waukegan in 1939 and is buried in the cemetery there. He and his wife Rebecca (née Thornhill, b. Beeston 1861) had no children. Rebecca died in Waukegan in 1943. Henry Stevenson : appears to have managed the Zion mill after his brothers had lost favour with Dowie. After his five year contact with Zion finished in 1906, he was leading participant in an initiative that established the American Lace Company at Elyria, Ohio (shown right). He became its general manager and employed many of the original lace workers who came to Zion from the Nottingham area. This company operated successfully up to about 1940. In 1913, Henry and his wife and family moved to Oregon, seeking a warmer climate and made a serious attempt to promote another lace factory, this time apparently not successfully, in Eugene, Oregon. For a time he worked as a bookkeeper for a local drug store. After his wife died in 1929, he returned to Waukegan, Illinois where he ran the Merchants Credit Bureau until his retirement. He died in Zion in October 1947 and is buried in the cemetery there. His ten children - two of whom had been born after their parents' arrival in Zion - lived out their lives in America. Jane Dowie, widow of John Alexander Dowie and their son Alexander John Gladstone Dowie : made continued attempts to regain power over the remaining followers in Zion but were unable to overturn Voliva's strong hold. Gladstone, who became a Presbyteriam Minister, continued the fight after his mother's death in 1933 and up to his own death in 1945. Zion City : continued in its original form, but under the control of the new management, until it went into bankruptcy in 1907. It has since emerged as a City, now in its own right with a present population of about 24,000. It has a thriving Historical Society which has a museum housed in Dowie's restored Shiloh House. The Zion Lace Factory : continued with many of its original workers - who had a five year contract - until it was taken over by Marshall Field's in 1907 after the Zion bankruptcy. Many of the original workers left at that time, many following Henry Stevenson to his new factory in Elyria, Ohio. Others stayed to make lace related products for the company's major department store in Chicago. This continued until 1952, when the lace machinery was sold to the Quaker Lace Company in Pennsylvania. A New Century, New Initiatives - The first decade of the 20th century and the following few years up to the Great War, was a period in which the basis of Beeston's economy shifted significantly. Having opened with the demise of Wilkinson's lace business - and the closure of the Silk Mill - there were, as we will see, a number of new initiatives by lace entrepreneurs which helped to retain the town's reputation as a centre for lace manufacture with at least four significant new ventures appearing in the first decade. But the continued phenomenal growth in population it experienced - increasing by over 2,400 to 11,336 in the ten years up to 1911, an increases of 25.5% - was mainly brought about by the arrival, or significant growth during the decade, of a number of new industries - notably in engineering - including National Telephone (soon to become Ericssons), Humbers (though was to close in 1908), Beeston Foundry and others. The textile industry also broadened to include more knitting firms - such as Barlows - and too, the retail sector became more mature with an increasing number of outside names appearing in the town. Widdowson & Truman - this firm began operating its curtain lace machines in about 1904, from a newly erected factory, known as Falcon Works, it built on the western side of what was then Brown Lane (now Station Road), a move clearly designed to fill a gap in the market left by the closure of Wilkinson's curtain operation. 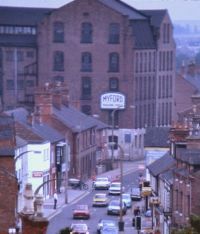 The building remained a feature of Beeston's street scene for over 60 years, is shown in the centre of the picture on the left. Position your mouse on the picture to highlight the site or click the image for help if you have difficulty in identifying its location.. The iniative behind the building and operation of this factory was Sam Weller Widdowson, a remakable man who made his mark, first working himself up to the position of Director with the pretigeous Nottingham lace manufacturer, Thomas Adams, before successfully setting up on his own as a lace manufacturer - and he has continued to be remembered as a sporting pioneer in cricket, athletics and, above all, in football. Later in his life he also became a cinema pioneer and build the Palace cinema on Beeston High Road. Comprehensive details of his own and his family's lives can be seen on our Cinema Personalities Page. Born in Hucknall Torkard in 1851, his life took a similar path to that of Frank Wilkinson, who had been born in that town in 1844. Somewhat ironically, by 1902, he and his family had moved The Hall, on Middle Street, Beeston where Frank Wilkinson had lived up to his death in 1897. It is difficult to be sure about the identity of 'Truman' in the firm's name as there were many of that name operating in the lace trade, both in Nottinghamshire and Derbyshire. It does appear that Widdowson and Samuel Truman, a well established Derby-based lace manufacturer, were trading at Stoney Street, Nottingham and Brook Street, Derby as lace manufacturers before May 1891, when they issued a legal notice that their partnership was disolved. However, there is plenty of subsequent evidence of the partnership persisting, at least in name. In December 1893, a lace design was registered in its name and, although Samuel Truman died in Derby in December 1899, the Beeston factory, nevertheless, traded in the name of the partnership. Sam Weller Widdowson died in October 1927, at his home in Beeston - by this time he and his wife had moved to 13 Meadow Road. They, and two of their daughters who died unmarried, were buried in Beeston Cemetery. As part of the settlement of his estate, he left the Falcon Works to his eldest son, Sydney Wilfred Widdowson who continued to operate it for lace making up the Second World War. In the 1960s. the site was sold to Beeston & Stapleford Urban District Council as part of the Central Beeston Redevelopment Scheme and the Widdowson family, then apparently running a garment making operation, moved to a then newly built factory on Middle Street, adjacent to the Manor House. Parkes Factory - Abraham Parkes was one of the first new tenants of the Anglo Scotian Mills after it had been acquired by Arthur Pollard from the liquidators in 1909. At this stage the firm occupied the right-hand part of the ground floor of the distictive part of Anglo Scotian Mills that faced Wollaton Road. To accommodate four curtain lace machines in this position, the floor was excavated to a depth of four or five feet - a move that was to pay-off for both landlord and tenant. 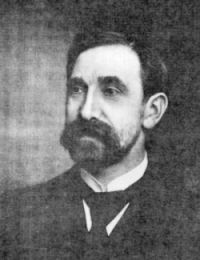 Parkes was born in Nottingham in 1859, the youngest child of a labourer, John Parkes and his wife Sarah. His father died when he was a child and, like many young boys at that time, he was put to work by the age of 12 as a threader in the lace trade. It had been a difficult start but, after working as a curtain lace maker for others for about twenty years - during which time, in January 1882, he married Caroline Clark - he began trading in partnership with William Tomlin from a factory in Lenton, Notts. By 1902, however, Tomlin had left to become the landlord of the Rose & Crown in Northgate, Basford and several of Parkes' sons gradually become involved. Certainly by 1911, the firm was well establised. Abraham had moved to live at 89 Imperial Road, Beeston with his two younger sons, Frank and Harry who were working as lace makers in the business and his youngest daughter Ethel who was employed in the office. His second son, Frederick Henry Parkes had first begun to train as an architect but, by the time he had married Mabel Kirby in 1909 and had set up home at 52 Crosby Road, West Bridgford, Notts, he was running the Lenton side of the curtain lace operation. Certainly by 1920, the business relationship between Frederick and his father was formalised with the formation of A & F H Parkes (Nottm) Ltd. The firm had continued to expand throughout the Anglo-Scotian Mills front building and, in about 1923, they bought the freehold and were to continue to operate there until the 1950s. Over these years the building became known locally as 'Parkes' factory' - a name sometimes heard today. Despite difficult times in the lace trade, the company adapted to a changing market. By the mid-1930s it was continuing to expand its production facilities and had diversified so that it carried out all processes through to marketing. By then, with a workforce that had grown to over 200, the company acquired a piece of land on Nuart Road, Beeston, to the rear of the Commercial Inn, that had been owned by Beeston Brewery. Here it constructed a small factory, with a 132 x 60ft workspace which housed a further five curtain lace machines and a supporting winding area. Even in 1946, the company continued to expand its manufacturing resource, when, in 1946, it aquired a small factory in Draycott, Derbyshire from the lace curtain manufacturer Skerritts, which had previous sold its manufactured lace to Parkes for finishing. Abraham Parkes had died in August 1943, aged 84. After his son, apparently in conjunction with his son Frederick Ralph Parkes, had largely taken over the reins in the early 1930s, Abraham and his wife had moved to Surrey Cottage, 12 Glebe Street, Beeston where they lived in relative retirement. For much of that time, their youngest daughter Ethel and her family lived there too and this continued there even after Caroline died in 1947. The company continued, in increasingly difficult trading conditions. Frederick Parkes had, by this time, moved to live at 86 Beeston Fields Drive, where he died in July 1952, following which trading soon ceased. Another local lace making company was no more. There is an important addendum to the Parkes family story. When Ethel Parkes, Abraham & Caroline's youngest child, wed Arthur Hilary Bristowe in 1920, she was marrying a man who had already made a mark locally. Born in 1880, he was already established as a mining engineer in Canada and had played cricket for Cambridgeshire by the time he was amongst the first to enlist in August 1914, when war was declared. While serving with the Princess Patricia's Canadian Light Infantry, he was wounded on 8 May 1915 and, just over a year later, accepted a Conmmission with the Oxfordshire & Buckinghamshire Light Infantry. This may have been an officially contrived move as, for the remainder of the war, as Lieutenant Bristowe, he served as the General Manager at the National Shell Filling Factory, at Chilwell, near Beeston. The factory had been built very quickly in 1915 under the direction of Lord Chetwynd, to address the acute shortage of shells at the Western Front. The scale of production was massive and highly mechanised employing 6,000 - upwards of 10,000 during the final push for victory in 1918 - of which 2,000 were women - who became known as 'Canary Girls' because exposure to the explosives turned their skin yellow. During the period that it was in production - from 8 January 1916 to the end of the war in November 1918 - the factory produced over 19 million shells, over 50% of high explosive shells produced in Great Britain during the war. However, on 1st July 1918, a massive explosion occurred there, that was heard and felt over a very wide area, taking the lives of 134 workers and injuring a further 250. Lieutenant Bristowe took a very active part in the rescue operations that followed. For his 'great courage and presence of mind', he was awarded the Edward Medal, on 21 January 1919. It seems likely that Ethel was working at the factory where she met her husband-to-be. After the war, and continuing after the marriage, Arthur Bristowe spent long periods of time working as a mine manager in Canada. It seems that, during the whole of this time, Ethel stayed at home with her parents and with her only child, Frank Hilary Bristowe who was born in 1921. Frank was to go on to have a respected career with the Royal Marines, serving in the Second World and beyond,rising to the rank of Colonel and was Mentioned in Despatches in April 1952. In April 1944, he married Noreen May Butler, the younger daughter of Major Hubert Blennerhassett Butler and his wife Sophie Marie (née Castravelli). He died in Kent in 1992. The Humber Works - after the Humber Company moved its production of bicycles and cars away from Beeston and relocated to Coventry in 1908, its then empty factory at the bottom of Humber Road was acquired for £11,000, by Arthur William Black, in March 1909. By this point in his life, Black had already found success as a lace manufacturer, sometimes in partnership with his brother, Walter H Black, and had held many high public offices, including Sheriff of Nottingham in 1897/98, Mayor of Nottingham in 1902/03 and was the first Chairman of Nottingham Education Committee. He had been elected Member of Parliament for Biggleswade in Bedfordshire, as a Liberal, in 1906. He was to be knighted in 1916. Born in Nottingham in 1863, he was the son of William Edward Black, a draper and smallware dealer, and Annie (née Spence), his wife. After an apprenticeship with the Nottingham lace manufacturer, Jacoby & Co he soon proved his worth and became a young man in a hurry. At the age of 21, he was already managing a lace factory and, by 1888 - aged 25 - he had taken over the business he had been managing. This and other businesses he started, grew dramatically, the ex-Humber factory at Beeston being used to house yet another extension to his plain net manufacturing capacity. Production of plain net soon got underway at the Beeston factory on a large scale, with various lace-related tenants in the remaining space. Managing the factory was William Henry Cooper (1887-1959), whose daughter, the late Margaret Cooper, was to become well known locally as a teacher and local historian. A fire at the works on 19th April 1917 and another on 24th April 1936 caused temporary set-backs and major and permanent damage which limited the space available for leasing to others, although Black's production levels had continued to increase in the inter-war period. By 1920, the company was operating 32 plain net machines, including six newly acquired giant machines of 274 inch width. As well as his business and political life, Black channeled much of his time and his money into his philanthropic activities and to furthering his Methodist beliefs. In July 1936, Sir Arthur donated 'Springfield', in Alexander Park, Nottingham, which had been his home since about 1908, to the National Children’s Home. Reflecting his interest in education, it was used, for many years, as a home for boys who had lost the chance of a secondary education following the death of a parent. Such boys, who were also successful in an entrance examination could then live at the home while attending High Pavement School. A life-long active Methodist, he became a local preacher at the age of 17 and helped establish the Albert Hall Mission in Nottingham, becoming its first circuit steward, took a particular interest in overseas missions and made a substantial donation towards the erection of The Albert Hall itself. Sir William died in July 1947 at his home in Nottingham's Park Estate. Despite his generous benevolence during his lifetime, he left the then substantial estate of £188,166. Bequests included a further gift to the National Children’s Home of 'Southbank', a property on Magdala Road, Nottingham, which was operated as a children’s home for many years. He left a third of his estate for the benefit of the Sir Arthur Black Charity, set up by him in 1938 to serve the interests of Methodism, including the Albert Hall, in Nottingham The charity continues to this day, making grants to individuals and organisations in need of support. Before his death, Sir William's lace making operation had been taken over by the Jardine Group which continued production at Beeston into the 1950s. By 1952, it is said that there were 118 machines operating at the factory, then the largest plain net undertaking in the UK. Like almost all lace making business in the town and generally in the area, this was not to last and there is now no sign of what had once been an enormous enterprise. Emmetts Factory - William Gidley Emmett moved with his family to Beeston in about 1887. He was born in Devonport, Devon in about 1858. His father, also William Gidley Emmett, was a grocer but died when William jnr was eight years of age, although his mother Margaret married again, within about a year, to a much younger man, George Bray Dingle, also a grocer. For a time, they continued trading as grocers in Stoke Dameral, Devon and had children of their own. By the time he was 13, William Gidley Emmett was working as an assistant to a draper in Shaftesbury, Dorset and ten years later was working, again as a draper's assistant, in Hackney, London. His wife to be, Annie Maria Hibbs (b. c1858. Luton, Bedfordshire) was also then working as a draper's assistant on Marylebone, London. They married in 1884 and, for a few years they lived in the London area, where two daughters were born. A son, also named William Gidney, was born very soon after their arrival in Beeston - and another son and, finally, another daughter, were born by 1890. By this time, Emmett had set up as a lace curtain manufacturer from an address at 38 St Marys Gate, in Nottingham's lace market and the family was living at Malvern House, an attractive villa near to the station in Beeston. They were employing a governess and a domestic servant. Quite how this remarkable transition, in just a few years, had been possible is unclear - but there would be one or two, sometimes incomprehensible, similar changes before they finally settled down. By 1900, his lace making operations were located on both Lenton and Radford Boulevards in Nottingham and the family had moved to live on Burns Street, in the fashionable Arboretum area of Nottingham, then popular with rising entrepreneurs. Within four years he appears to have formed a business partnership with Edward Munk, the son of the wealthy retired farmer, Harry Monk, who lived at Elm House, High Road, Beeston, adjacent to what is now Broadgate Park bowling green. Trading as 'W. G. Emmett & Co' they were located on Wollaton Road, Beeston, either at Anglo Scotian or Swiss Mills, by 1904. Within the next few years, certainly by 1910, the company had built its own factory on Station Road and had commenced operations there. 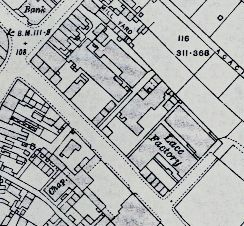 Evidence as to its exact location can be gleaned from the Ordnance Survey map of 1914 (shown left). This shows an L-shaped 'Lace Factory' with frontages on both Station Road and what became known as Marvin Road. However, it is known that the frontage onto Station Road was acquired for conversion into the Lads' Club in 1913 so the map, notionally dated 1914, was already out-of-date. As directory entries as late as 1932, show 'W G Emmett & Co' apparently trading from a location immediately adjacent and south of the Lads' Club, it is tentatively suggested that this was from a surviving part of the factory, fronting onto Marvin Road which was later incorporated into the Lads' Club complex. By 1911, William had made another somewhat surprising move as he is found living at The Chestnuts, Long Whatton, Leicestershire with his youngest son and youngest daughter. His eldest son, William Gidley Emmett, had graduated from Cambridge in 1909 and had already started what was to be a remarkable career in chemistry and, later, in educational research which is detailed here. His second daughter, Mabel. had married Archibald Nairn Baird in the previous year. His wife and eldest daughter were not at home at the time of the census. His involvement in the Beeston factory continued, although, in January 1913, Edward Munk withdrew from the business. Now the sole owner of the firm, Emmett moved back to Beeston, and lived at 6 Broadgate up to about 1920. It is from this address that his second son, Reginald Boutwood Emmett, enlisted in May 1915 for the duration of the War, serving in France as a Lieutenant with the Sherwood Foresters. Prior to their deaths in December 1924 and October 1928 respectively, William and his wife Annie, moved to live at 'Blenheim', Elm Avenue, Beeston. In his will, William left the then substantial sum of £6,738, solely to his wife. His wife left £14,917, some four years later. William's lace curtain business is believed to have been sold to the firm of Hewitts who continued to operate it in the Emmett name after the second world war, when six machines are known to have been working at Station Road. Steady Decline - the Great War (1914-1918) was to become the turning point for the lace industry generally and in Beeston particularly. The industry would never return to the levels of prosperity that it had experienced in its hey-day. Production had, of course, been curtailed during the war years and never again reached the levels known in the boom years. The home market was hit by difficult economic conditions in the inter-war years and by the, perhaps inevitable, changes in fashion that matched the downturn. The American export market, which had largely fueled the boom years, took less and less British-produced lace - although it continued to take lace from the UK that had been sourced from other countries and re-imported - as the economic downturn hit there too, such that its home requirements could be met more readily by its own lace manufacturing operations. While the drop in American demand could, to some extent, be replaced in by exports to countries within the British Empire - indeed, by 1939, sales to that market reached two-thirds of all UK-produced lace - this was a share of a much lower overall volume. Inevitably, these changes in demand hit the Leavers lace makers - which served the quality, fashion-dependant end of the market - the hardest. In Beeston, this meant most to Pollards which, by the early 1920s was forced to put many of its workers on half-time. The earlier era in which skilled 'twisthands' were highly-paid, elite workers, often characterised by their bowler-hats and white aprons, was over. Inevitably, as the industry declined and smaller operators went out of business, there where fewer lace tenants for Pollard's Swiss Mills and Anglo Scotian Mills - where the number fell to only four by 1935 - and, increasingly, tenants in other trades began to take up the slack. Any hope that things would change was effectively extinguished by the Second World War when lace production was almost entirely halted and factories were diverted exclusively to war production and use - Pollards made hairnets and stored military supplies - and in the years that followed the war, with home sales prohibited up to 1952 and machinery often in poor condition, production never again came close to the old levels. Many of Pollard's machines had been scrapped during the inter-war period and between 1951 and 1956 the last of the machines were sold. 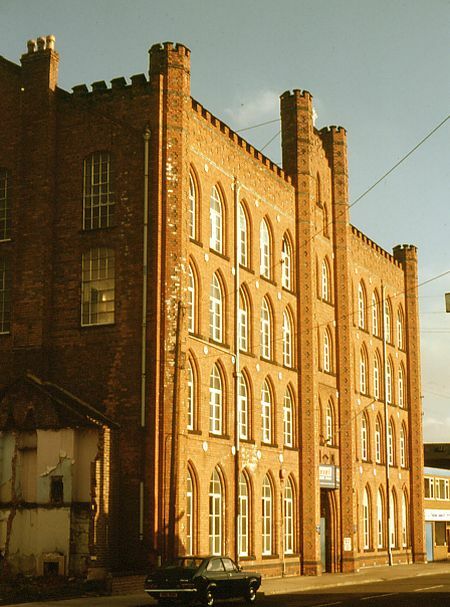 The Anglo-Scotian Mills and most of Swiss Mills was sold during the 1960s - although John Pollard, the last of the four generations of lace makers on the Swiss Mills site, retained an office in the earliest part of the complex. His nameplate (shown above left) was still to be found there until the disastrous fire (shown right) in 1984, after which the site was cleared and redeveloped. Lace net and curtain lace firms fared rather better than Leavers manufacturers in the post Great War period, in Beeston, as elsewhere. Locally, we can point to the curtain lace maker, A & F H Parkes and to Blacks, the plain net maker, both of which managed to do relatively well into the 1950s, despite the inevitable disruption that war brought. The stark fact remains, however, that after the 1950s, lace making, the huge industry that had been a mainstay of the Nottingham's economy for over one hundred years, was operating at very low levels - and, in Beeston, was virtually at an end. The contrast between the boom years of the 19th Century and now is stark - then lace machines operated in factory spaces throughout the area, now, almost all the factories have gone or are in other uses and there is just one operating lace factory in the area - Cluny Lace of Ilkeston, a Leavers lace manufacturer, is that sole survivor.